Back when I was a young boy, just becoming a young adult, my Father yelled to me in the house. “Come outside. I want to show you how to grill.” I looked at my Dad and said “how hard can it be? You put the hamburger patty on the grill. It turns brown. You flip it. Then you eat it.” With that my Dad made me get two eggs from the fridge and he made me breakfast of the grill. My young mind was blown. That’s the day I learned that fire is just a heat source and if you respect it, you can tame it. Respect the fire and you will own it. 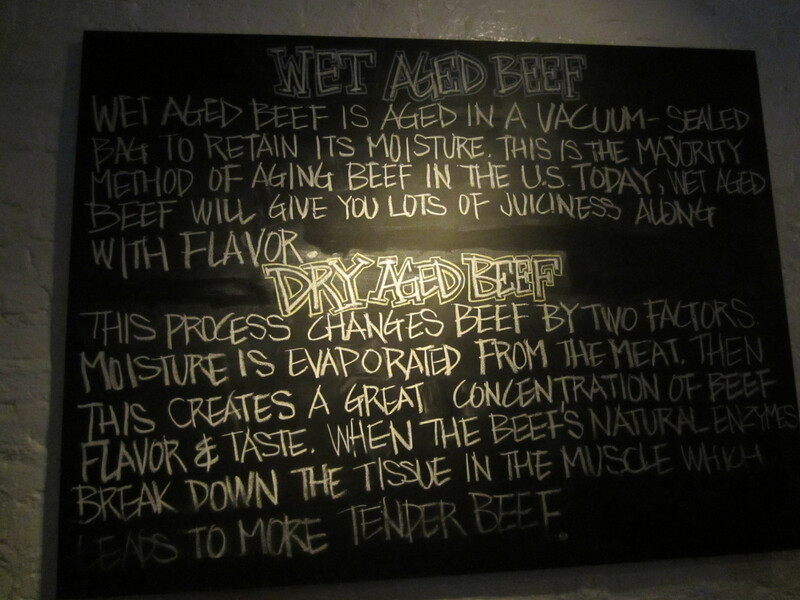 That’s kind of the mantra at NYC’s Peasant. The SoHo eatery servers rustic Italian fare, all of which is cooked in a gigantic wood burning stove. Whether it’s the pizza, the pasta or the meats, it’s all tamed under intense wood burning heat. 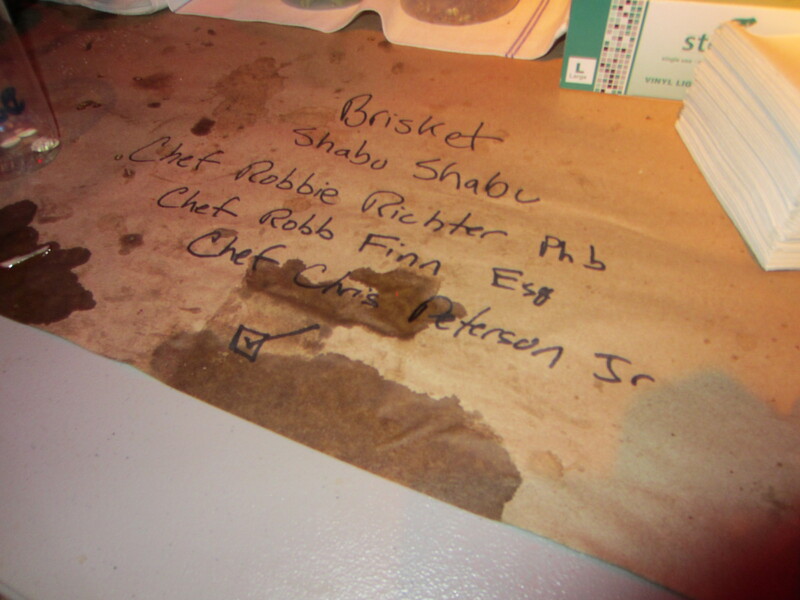 Dishes are in limited quantities, especially the seasonal and nightly specials so be sure to ask as soon as your seated. If you hear something you want to shove in your face, speak up immediately. I love a restaurant with a one page menu. It says they know what they’re good at cooking and they want to share it with you. One more thing about Peasant, they keep it very natural in the restaurant. Most of the light is by candle and there isn’t a whole lot. As a result, it made things tough to get good pictures. I didn’t want to be blowing off a flash every couple of seconds in a packed dining room so therefore my pictures will apear a little dark. You’ll get the gist regardless. Sounds like a perfect way to celebrate joeC’s birthday! 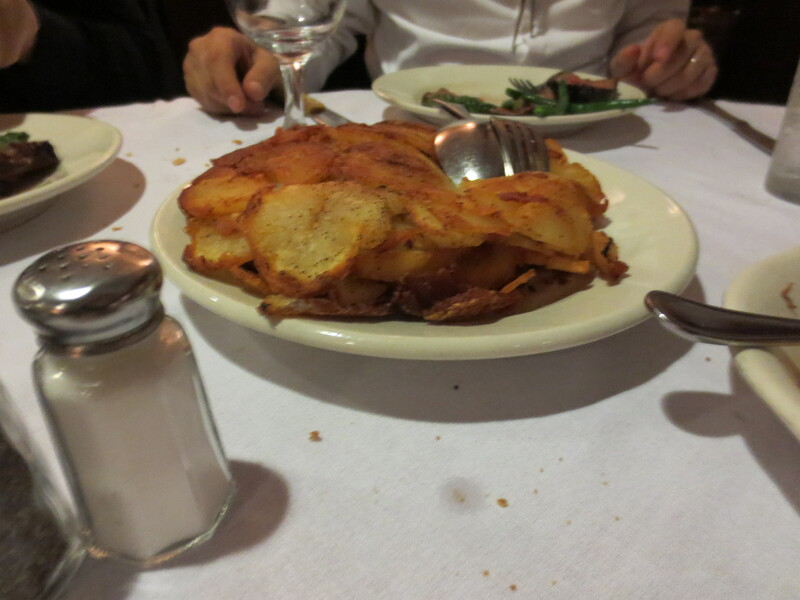 The meal starts of with some of the finest, crustiest, most perfectly baked Italian bread in the 5 boroughs. 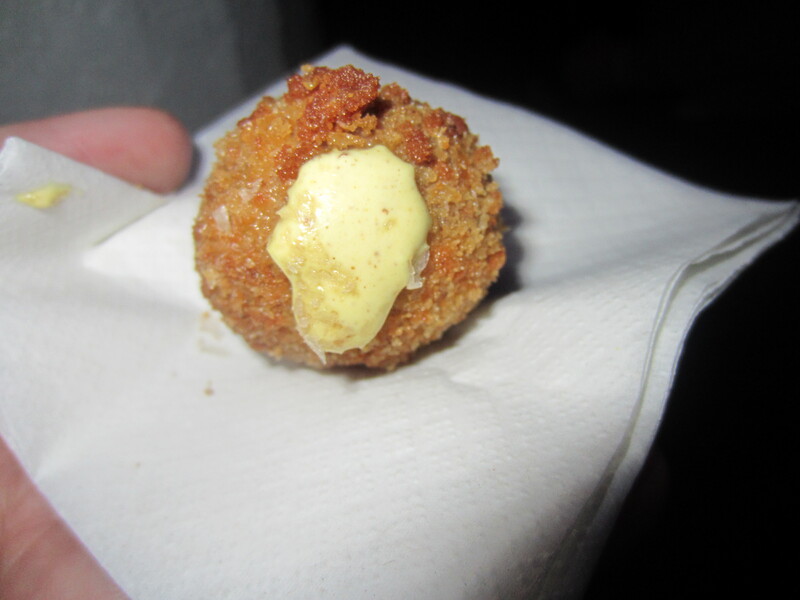 The inside are white and soft while the crust is not quite chewy, not quite crusty but all tasty. Eat it alone, with olive oil or with cheese but definitely eat it. 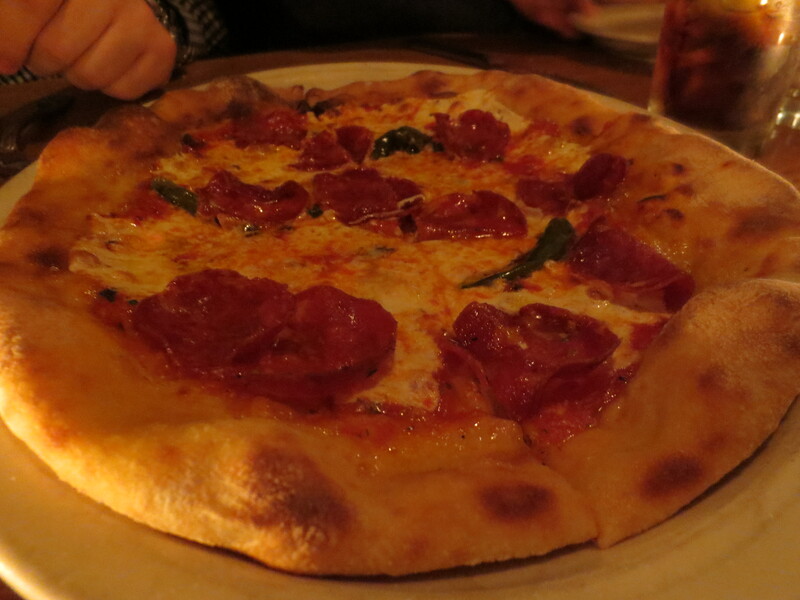 Again, it’s just fire, but if you’re going to perfect cooking in a wood burning oven you have to make a great pizza. Thankfully, Peasant does that. 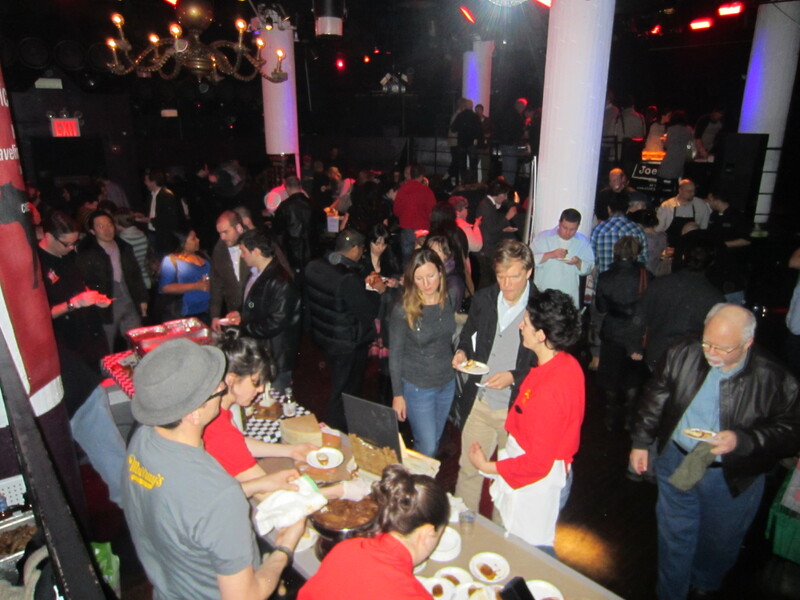 Be sure to get whichever most strikes your tables fancy and eat it! The pizza is legit and made with very fresh tomatoes. The whole pizza is so delicious and robust; Crispy crust, buttery cheese with a nice creaminess, good spice if you order the spicy sopresatta and peperoncini. 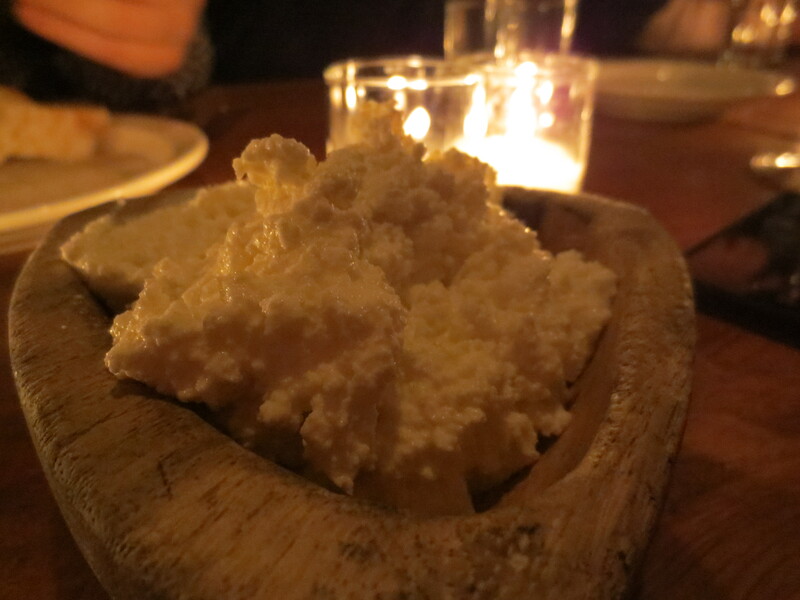 Have you ever eaten burratat? 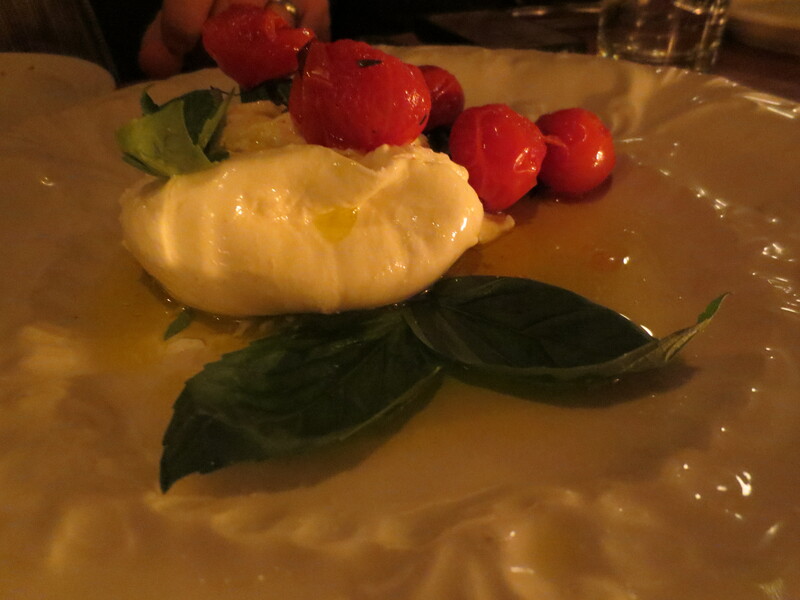 To put it simply, it’s fresh creamy mozzarella stuffed into less creamy but still fresh mozzarella. 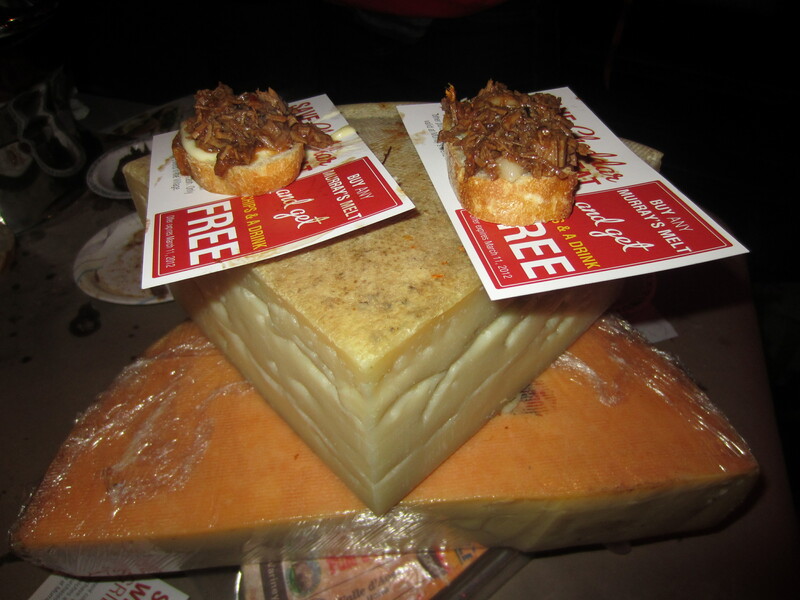 Some say it’s cheese, I say it’s a work of art. Do not miss out here and be sure to eat the basil, it’s incredible. 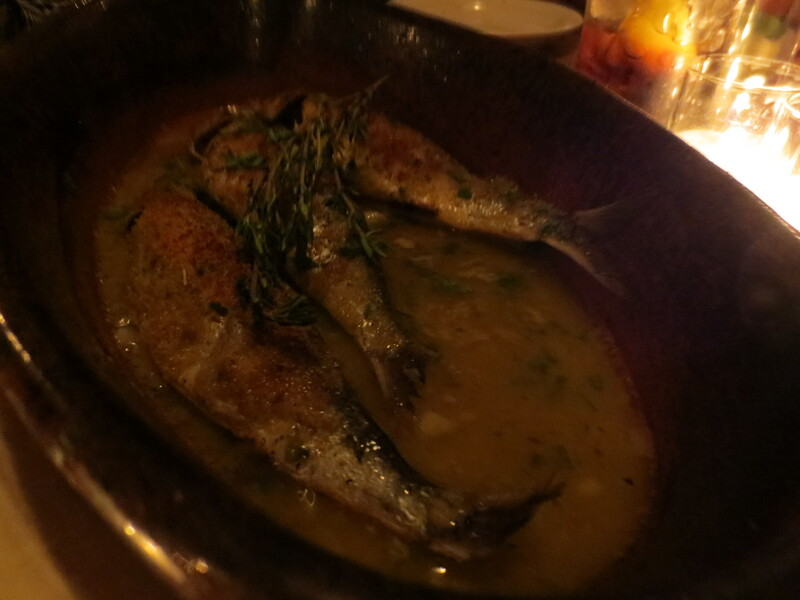 One of the specialties of the house is their sardine dish. There was no way in hell I was even going to consider taking a bite of this. The other guys a the table were loving it. 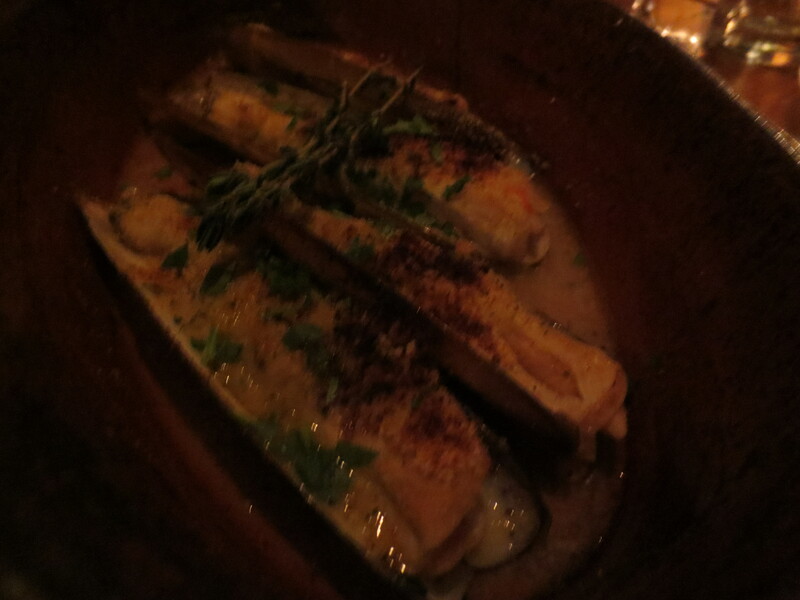 Speaking of seafood, I won’t eat, how about some razor clams? No thanks, but they did smell good. The rest of the 7 thought they were great. I love pasta and I’m a sucker for great pasta. I love all kinds of Italian dishes but if I could eat pasta for every meal, you bet your bippy I would. 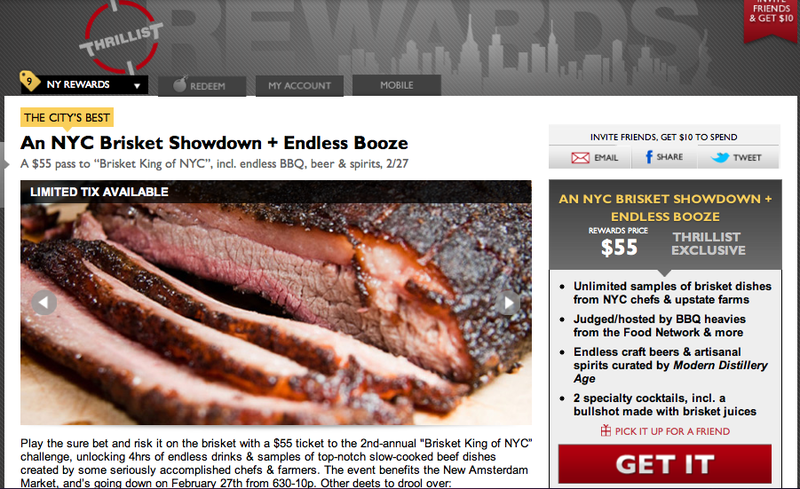 Realize too, that’s coming from the guy who pens Burger Conquest, The NYC Wing-Off & Steak Club 7! When it was asked at the table if we wanted to split some pasta for the table, I demanded that we do. 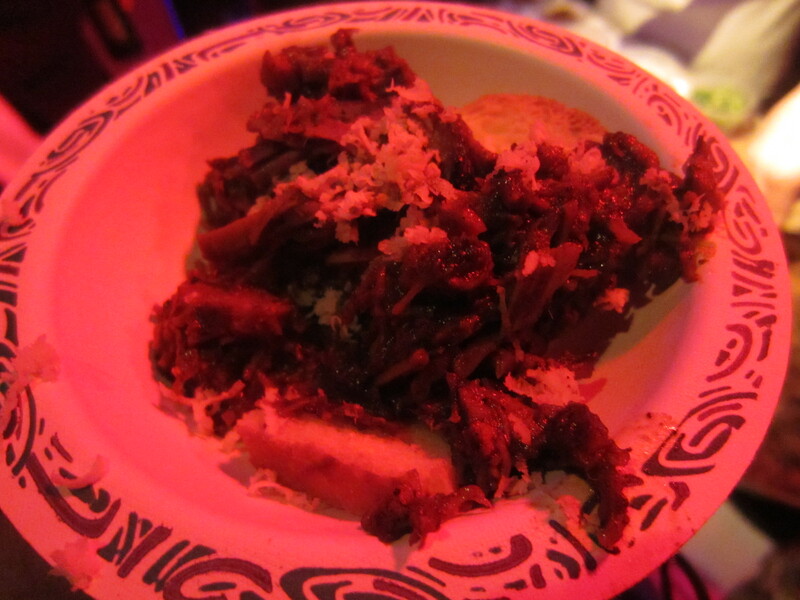 The Lamb Ragu – unreal. Get on your horse and ride. Incredibly savory. 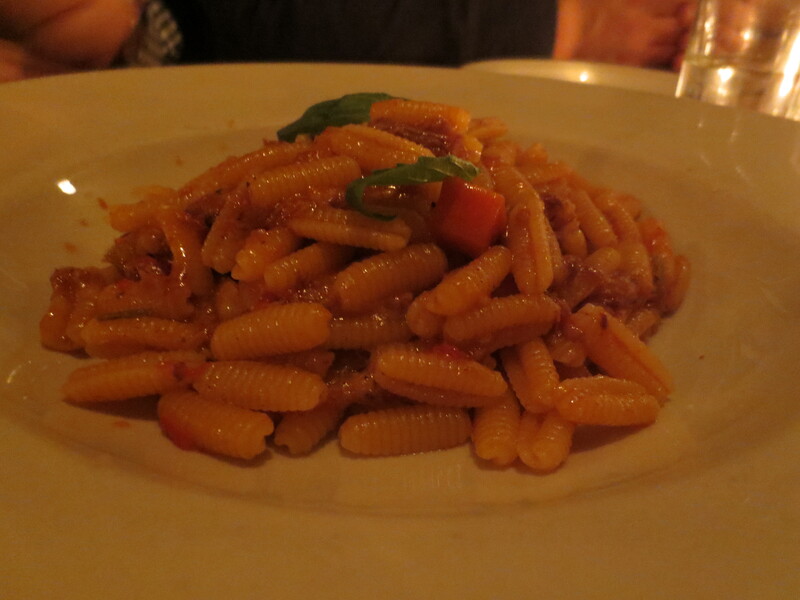 Perfectly cooked cavatelli. Perfect au dente. 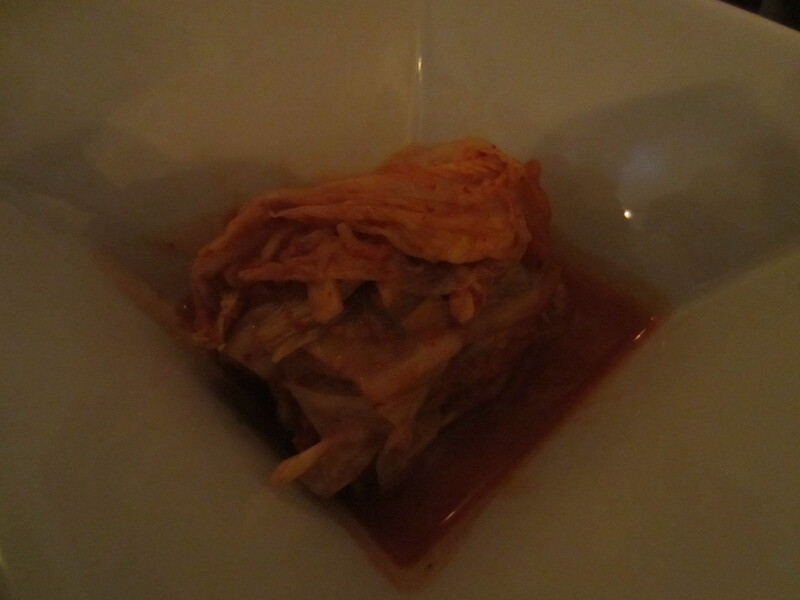 The pappardelle was just simply delicious. Amazing use of basil. A true example of what happens when you take your time cooking something. 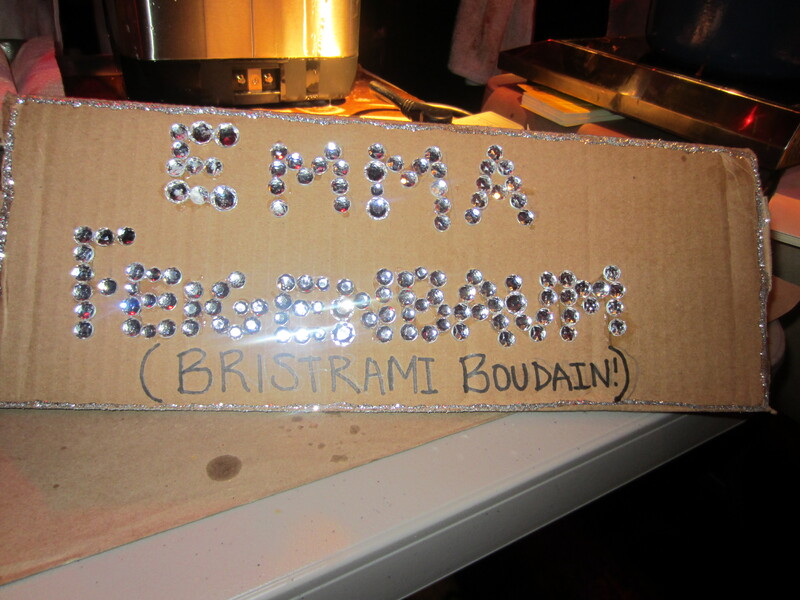 The pasta was a double dose of awesome. 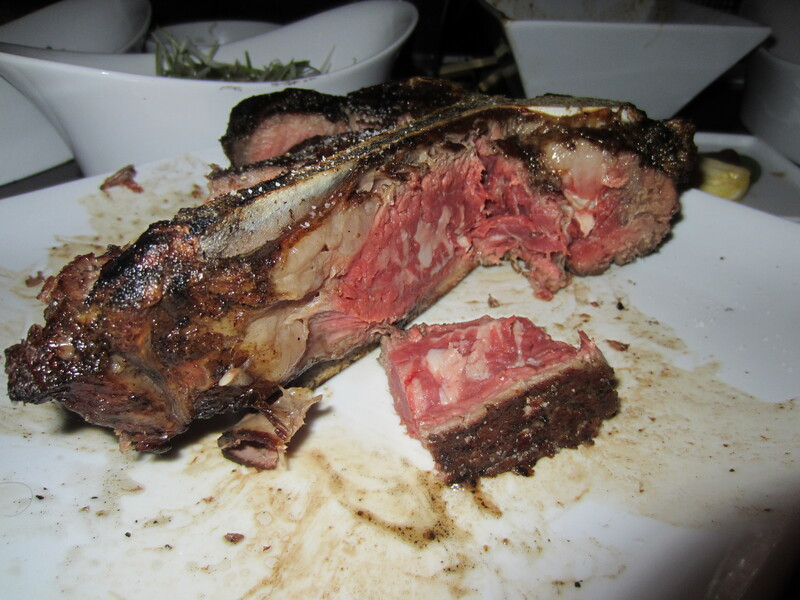 Most of the fellas ordered the bistecca alla fiorentina. 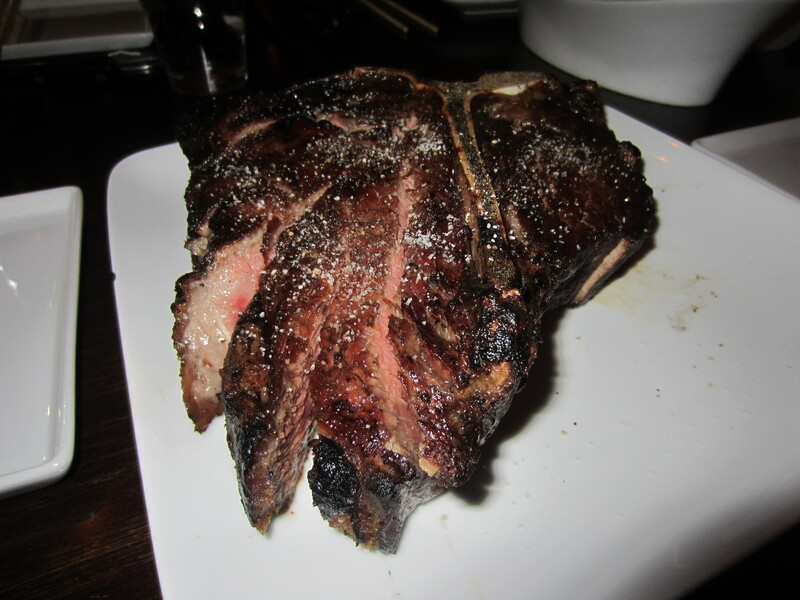 It’s a classic preparation to a classic steak; 28 ounce of dry-aged t-bone beef. One of my favorite ways to prepare steak. It comes with a side of Mac n Cheese. While normally it wouldn’t even be in question for me to order this, the cards were in a different hand. 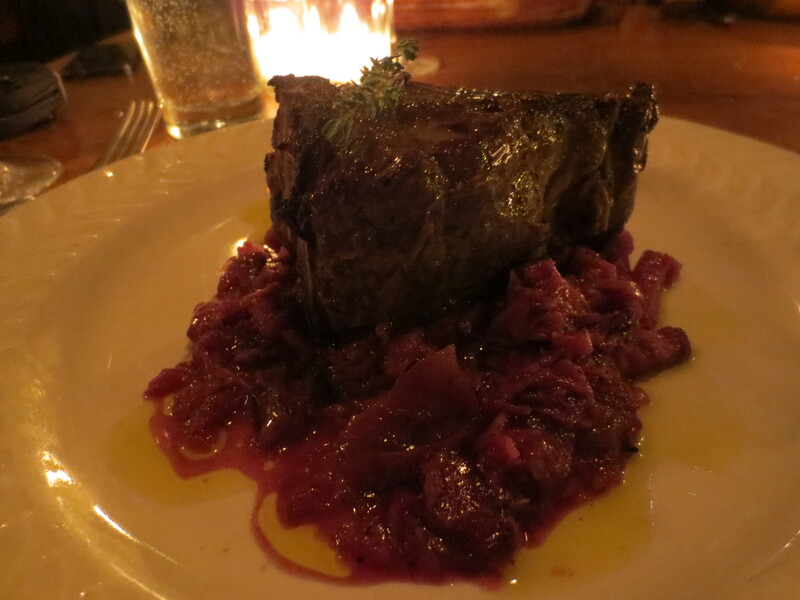 It in limited quantities every night but the seasonal special at Peasant is my favorite dish on the planet, venison chops. Here it’s served on cabbage reduced with prosciutto. The server couldn’t even get the full description of the dish out before my hand was in the air signaling that I had to have one! 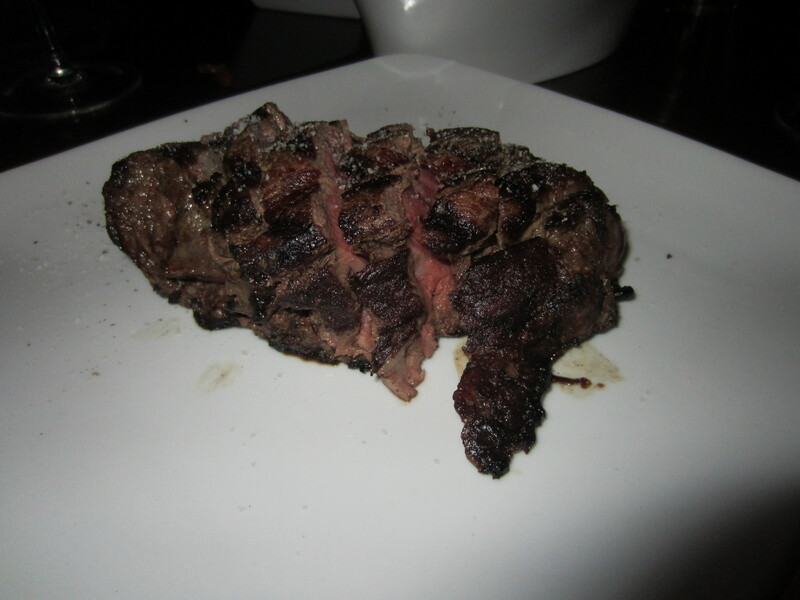 Unfortunately my venison, much like the guys’ bistecca alla fiorentina it was incredibly undercooked. In fact, the French called it black and blue. 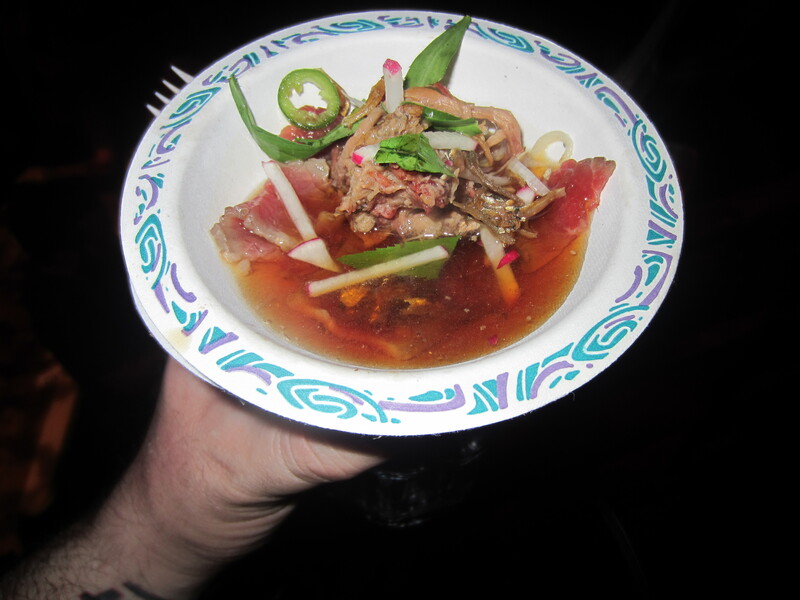 Now don’t get me wrong, I think tartare is stupendous, so I am not afraid of raw meat. 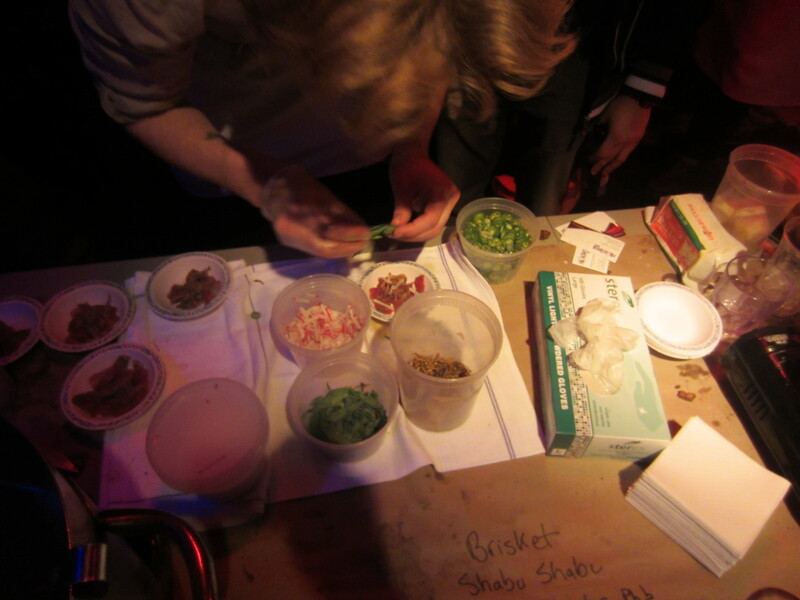 Tartare however needs to be prepared a certain way. A steak that’s just raw on the inside but charred on the outside is not even close to medium rare which is all what we prefer. I hate to say something negative about a restaurant that otherwise we loved but this really brought it down a notch for me. Especially with such a great cut of meat. Box on the other hand had a different story to tell. Peasant tries to use as much of the animals as possible as they would in Italy. 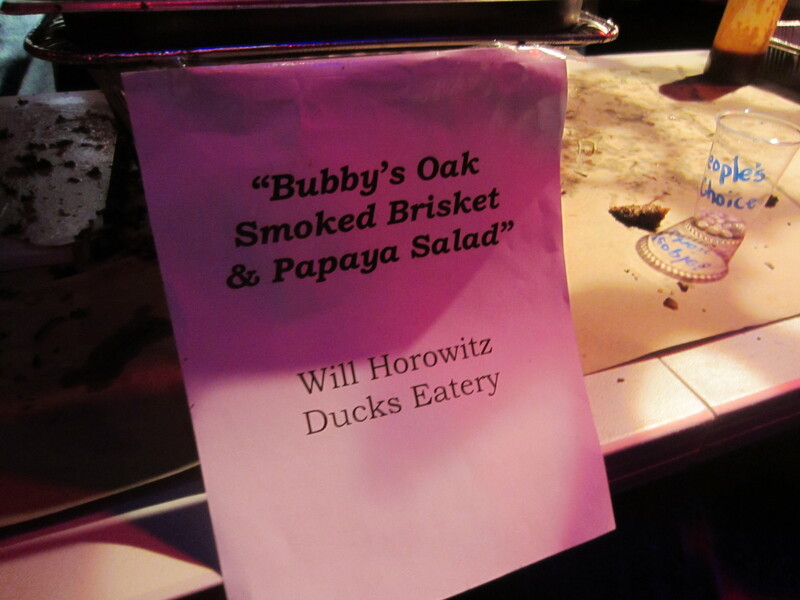 As a result, tonight they were offering a split and cooked suckling pig’s head. Box is a huge pork fan and couldn’t pass up the opportunity. A good steak dinner needs a good green to accompany it and Peasant does it right with Italian green beans. 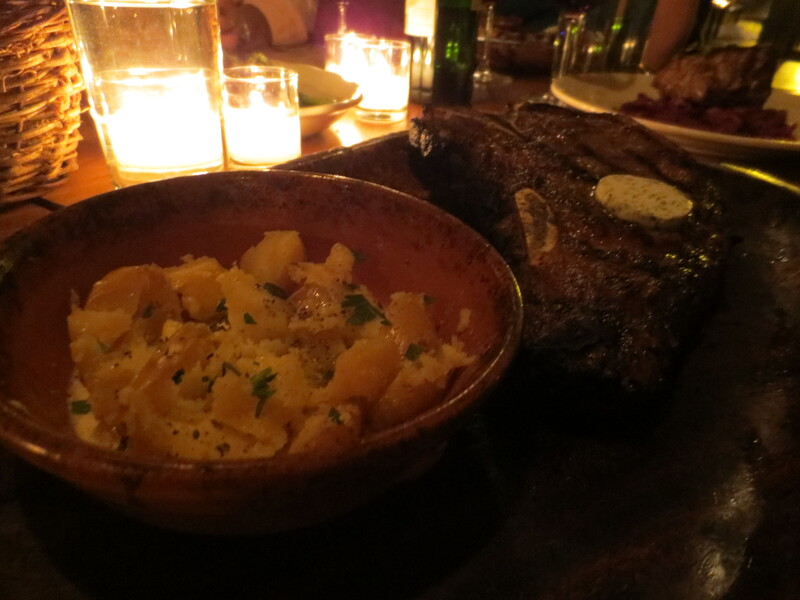 With the exception of my steak preparation, which can easily be changed, I thought Peasant was great. Would definitely go back for more! 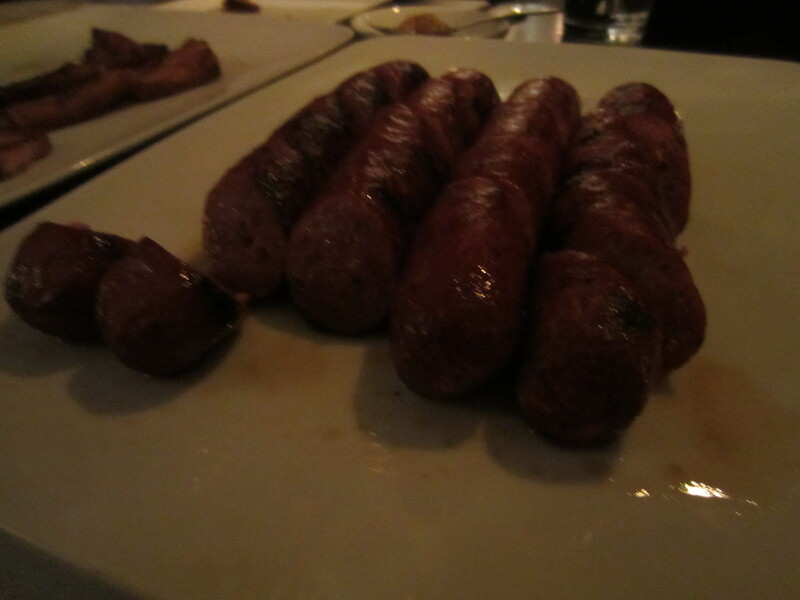 Ever since I ate at Pietro’s with Steak Club 7 back in June of 2009, I’ve wanted to go back. 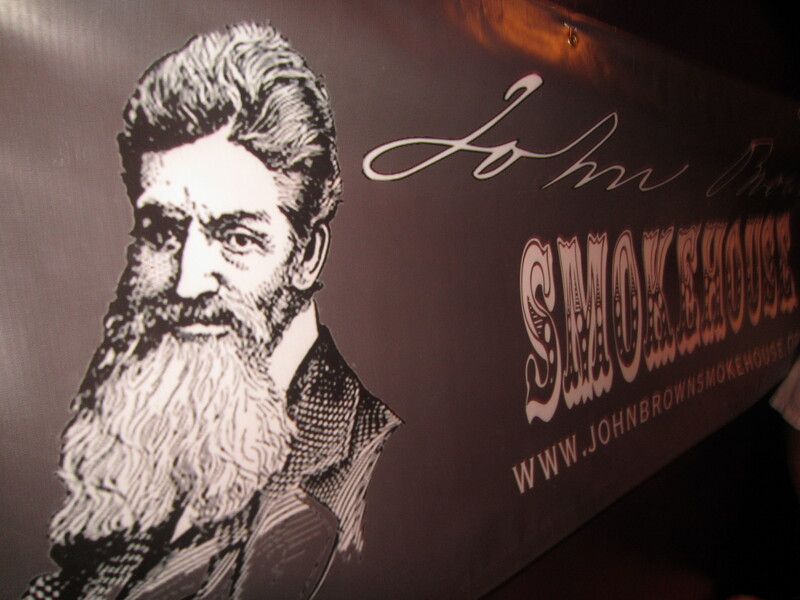 The food was great, the service was excellent and the good times were a plenty. There’s a lot of Steak restaurants in NYC and there’s also a lot of great Italian restaurants. 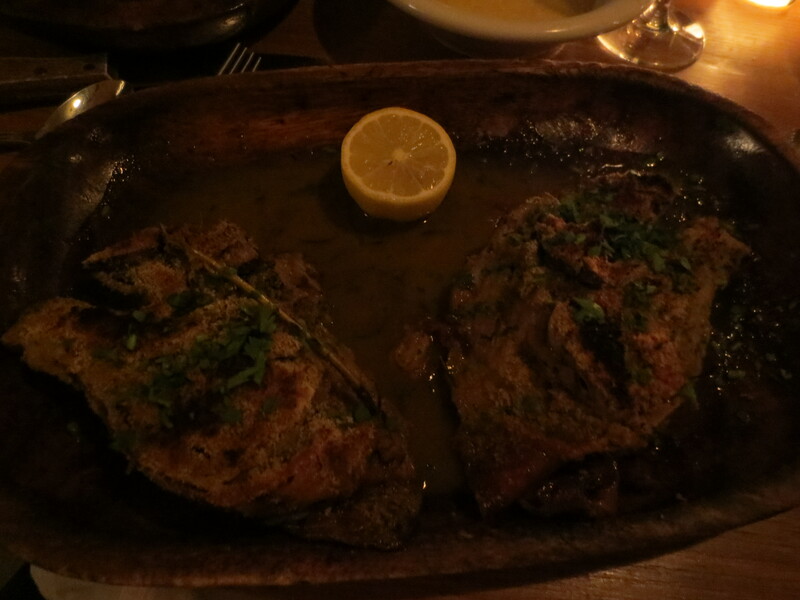 However, there aren’t a lot of old school Italian restaurants that also seve great chops. 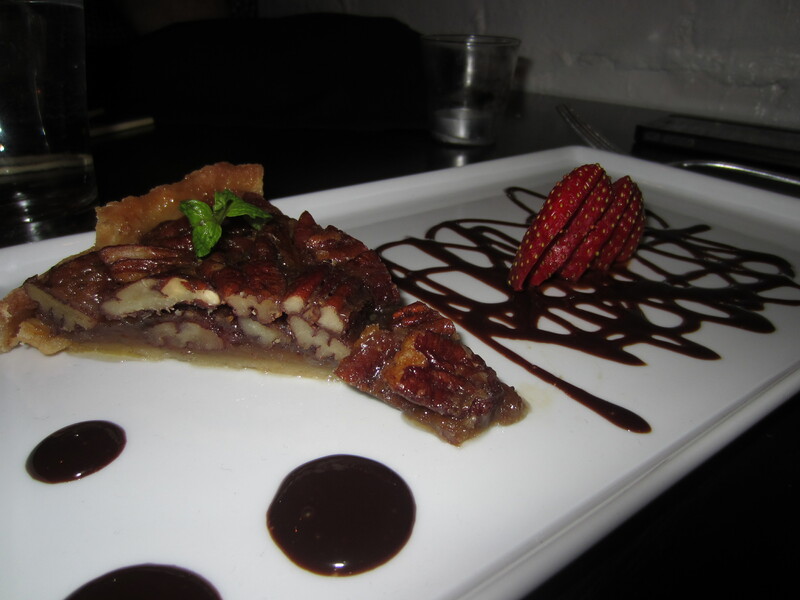 Pietro’s is the place to go for both! This Italian-leaning steak house opened in 1932, this restaurant passed hands when original owner, Pietro Donini passed away. In 1984, Pietro’s moved to it’s current location on 43rd St.
As we do every year, some of my friends from the music business and I get together for a yearly holiday Steak dinner. 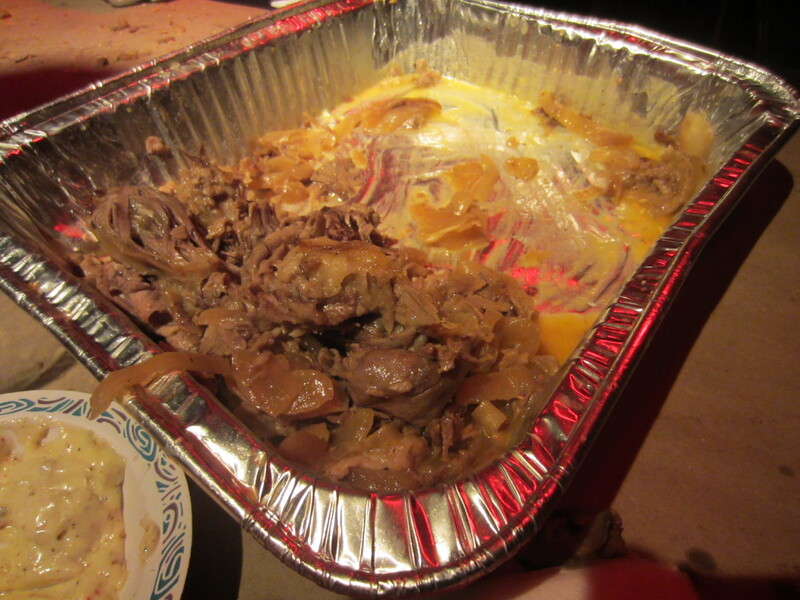 With last year’s dinner having some lack luster results, I wanted to bring it back this year and suggested Pietro’s. This was going to be exactly the vibe we were looking for. At this point, it’s now a tradition. 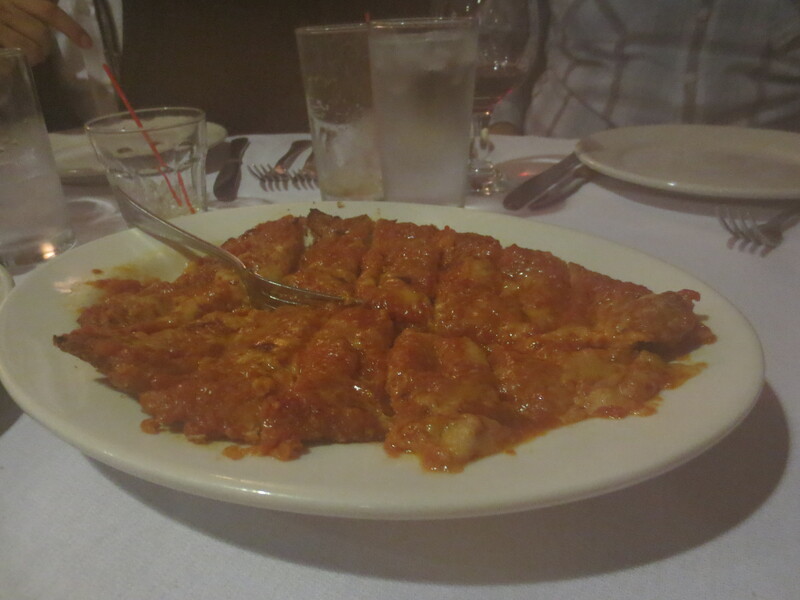 Start off your meal with a platter of Pietro’s delicious chicken parmesan. It’s mighty big but it you have enough people, it’s perfect to split. 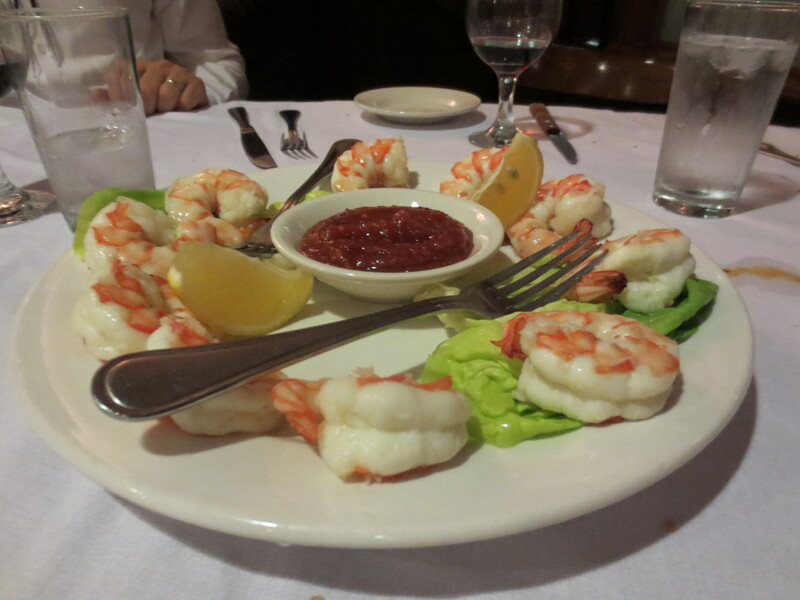 It’s a part of what many of my friends consider an essential part of a steak dinner, but I can’t stand shrimp, so I didn’t have any. I’m sure the rest of my table disagreed. 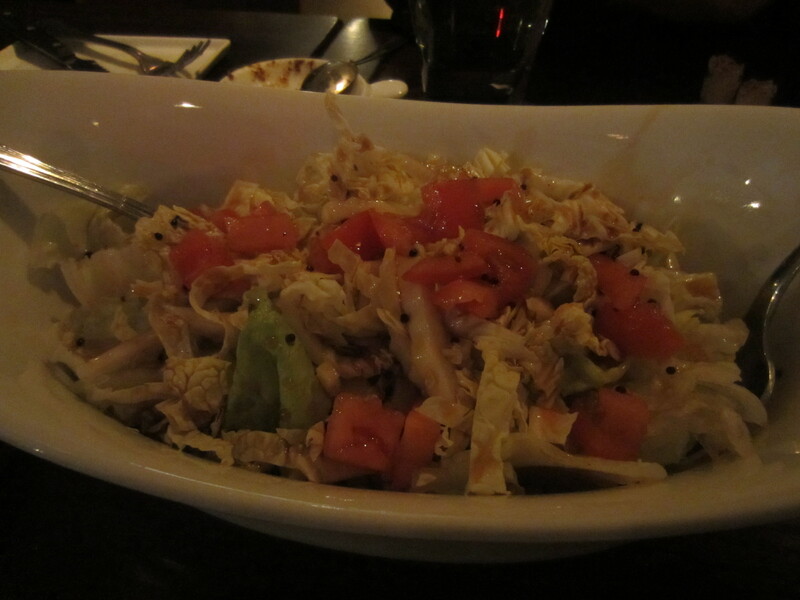 It’s NEVER a bad idea to have some roughage as part of a meal this big and intense. 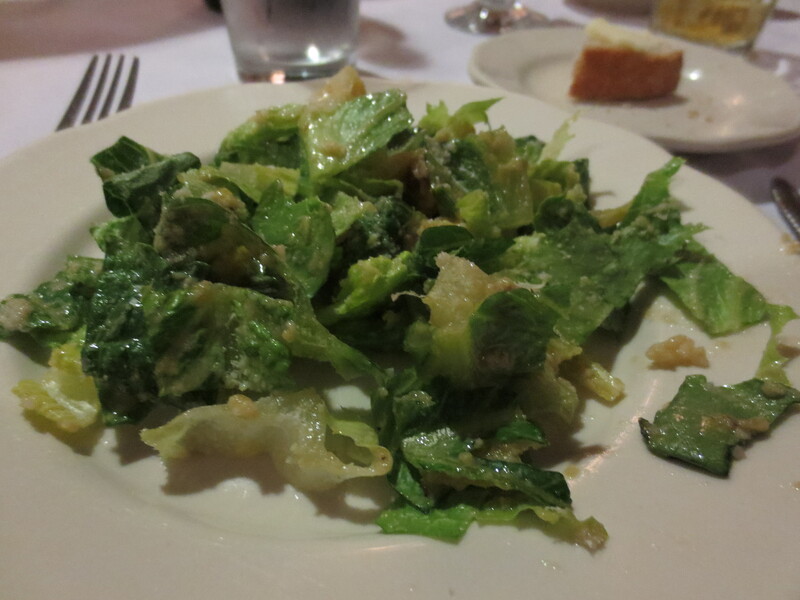 The savoriness and intense flavor of a Caesar salad usually does the trick. 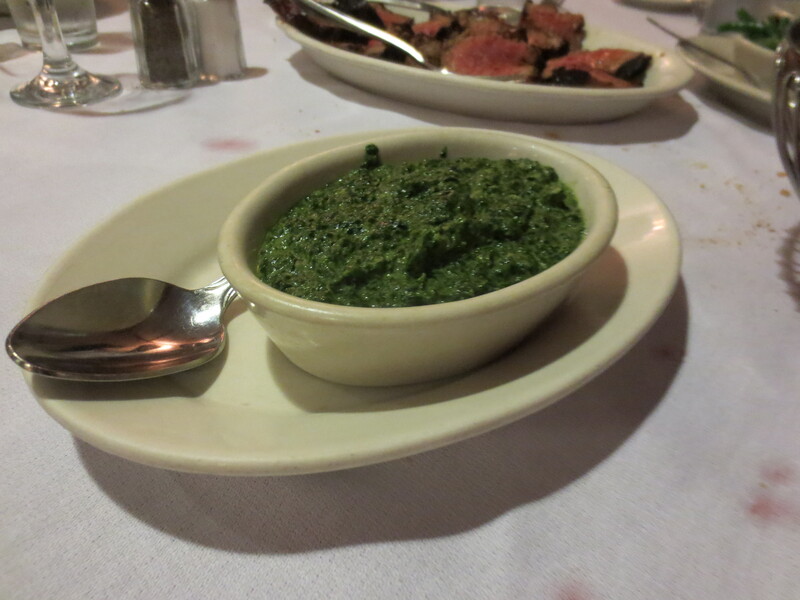 Creamed spinach. I will never understand why people love this dish but they do and its extremely popular with steak dinners. 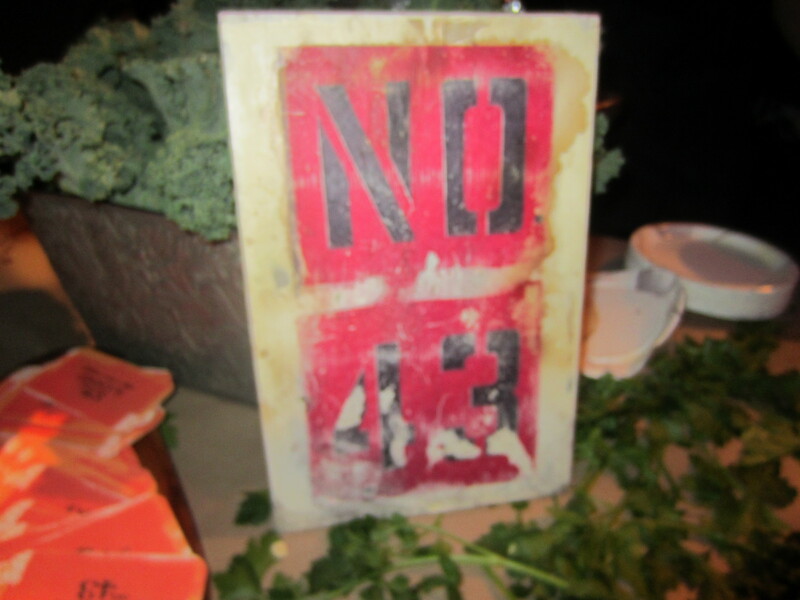 My negative nancy-ness aside, I’m sure everyone else at the table would rave about the dish at Pietro’s. 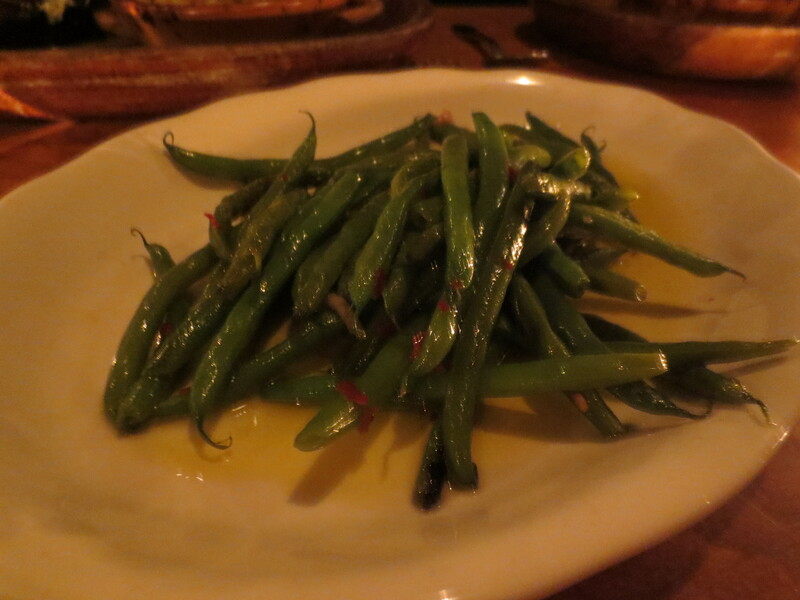 Garlicky green beans, now we are talking my style! 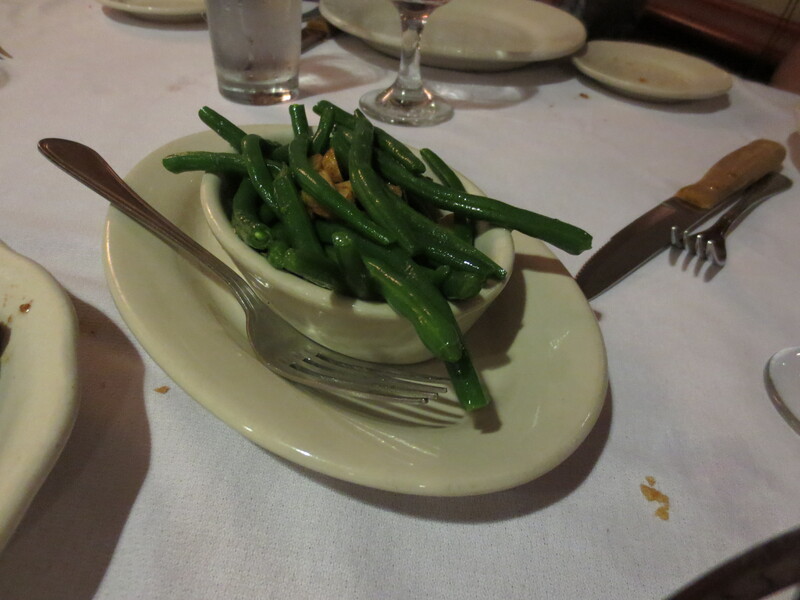 I love love love green beans with steak and these were great. Bring on the start of the show, STEAK! 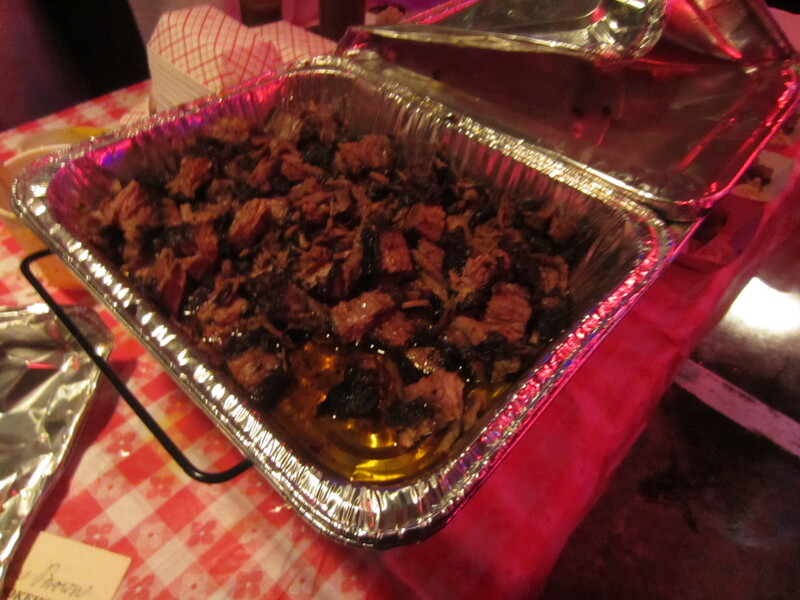 Pietro’s offers a number of steak options but there is only one way to go. Come with a lot of friends and order steak by the number of people at the table. They’ll slice up a porterhouse and serve it to everyone at the table. Look at this picture. LOOK AT IT! Holy Wow! Yes it looked perfect and it tasted that way. 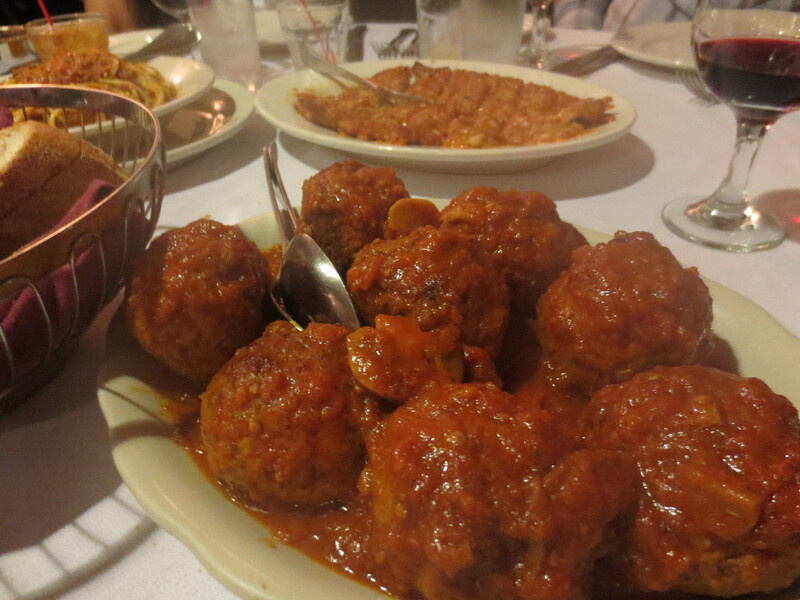 You gotta have a little starch with a large steak dinner and Pietro’s offers you 9 choices! None of them will take you down a bad path but I definitely suggest the hash brown potatoes. 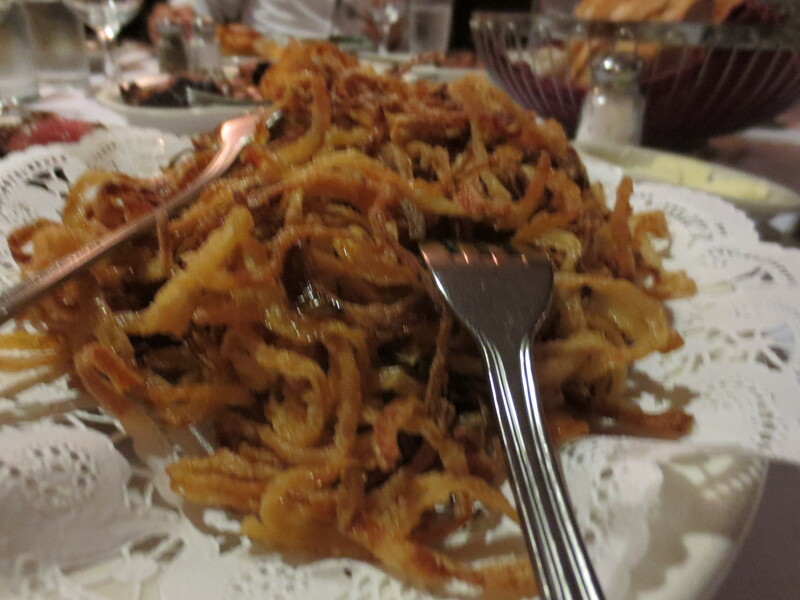 While your at, try a helping of the french fried onions. They’re nice and crispy and work really well with witha juicy bite of steak. 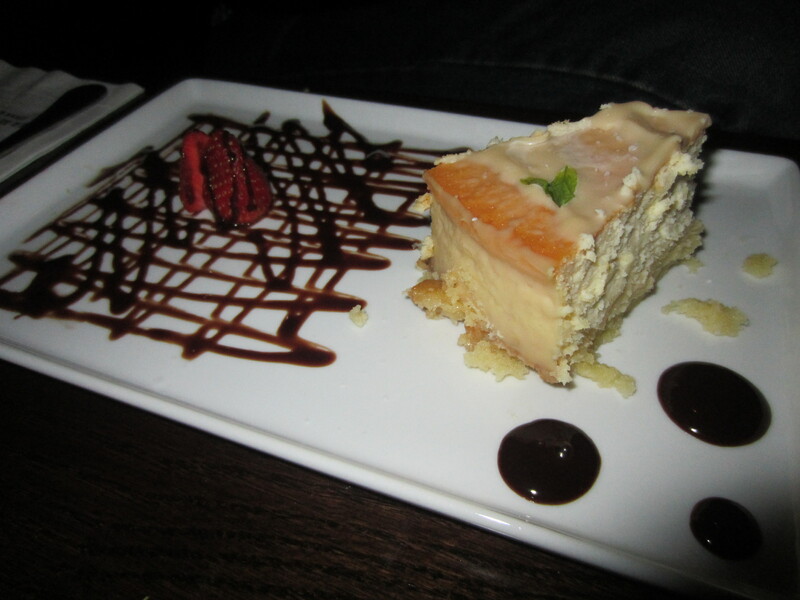 Somehow not satisfied with the feast we had just ripped through,most of the table wanted to split desserts. 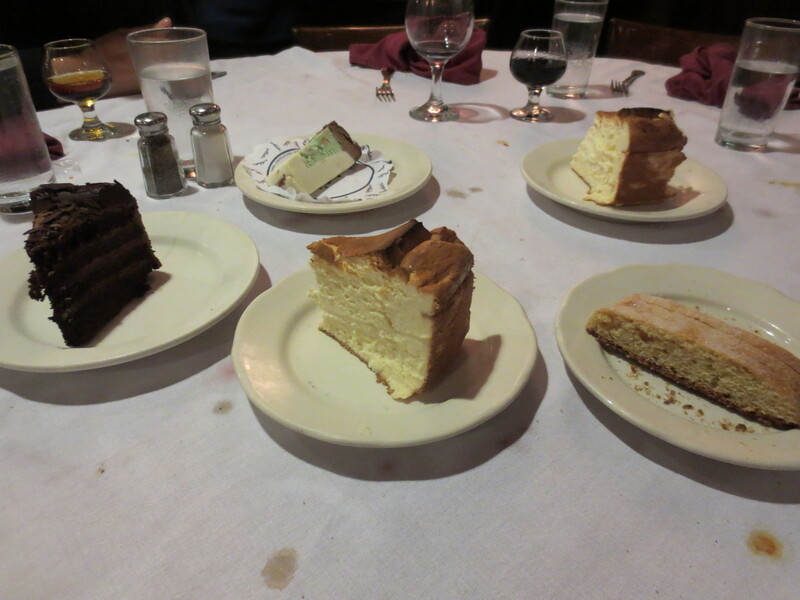 While they were all good, the Italian Cheesecake (made with ricotta, not cream cheese) was outstanding and absolutely worth finishing off your meal. 2.5 years later, Pietro’s is definitely as good as I remember. It’s definably classic NYC in it’s style, presentation, location and feel. 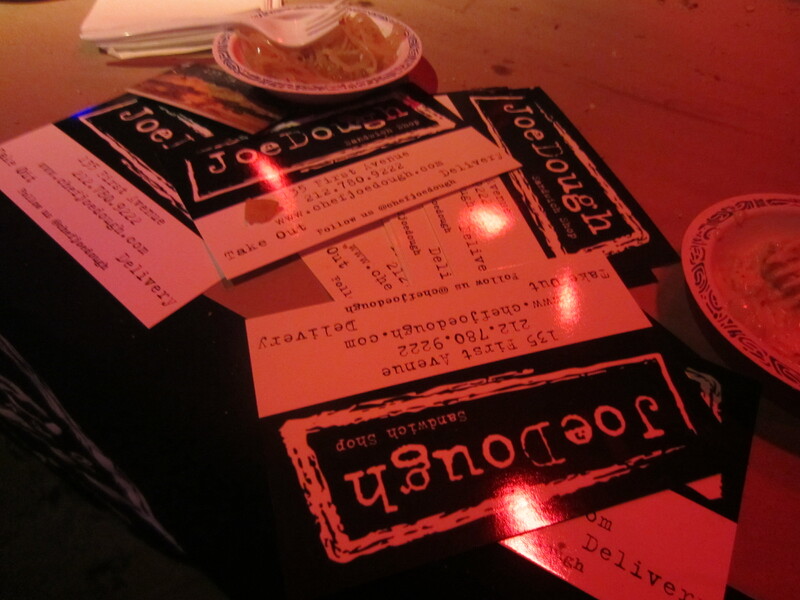 The food is absolutely awesome, the service is top notch and the vibe is fantastic. It’s good for dates, parties, corporate dinners, dinner meetings and for 8 guys who get together once a year, dress up in their Sunday best and go out to celebrate the holidays by eating steak together. Steak is a fantastic dish and should be celebrated. There’s no better way to show your love for it than to share it with your friends. 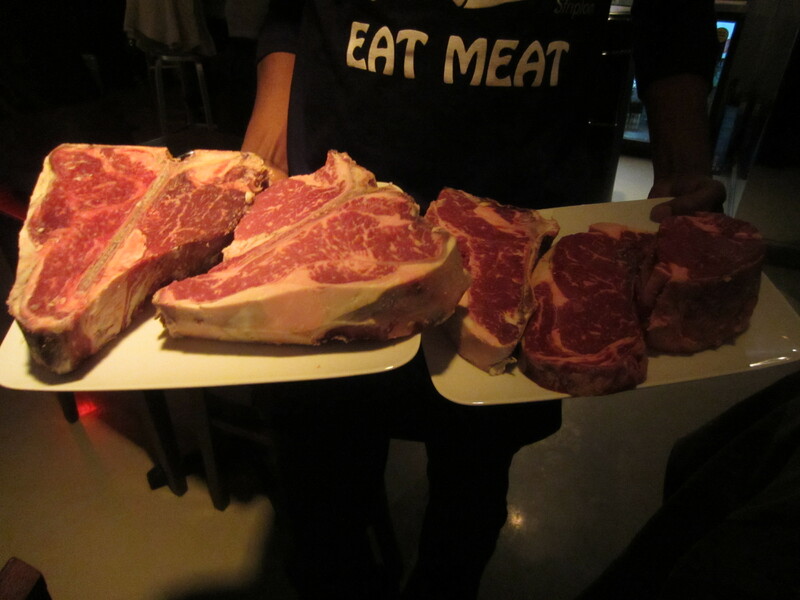 That’s the whole motivation behind the World’s #1 Steak Club, SteakClub7; to eat, share & enjoy Steak with your friends. Which steak, where’s is prepared, how it’s made, well that’s up to your interpretation and for this month’s Steak Club outing, we chose to diversify up the palett. 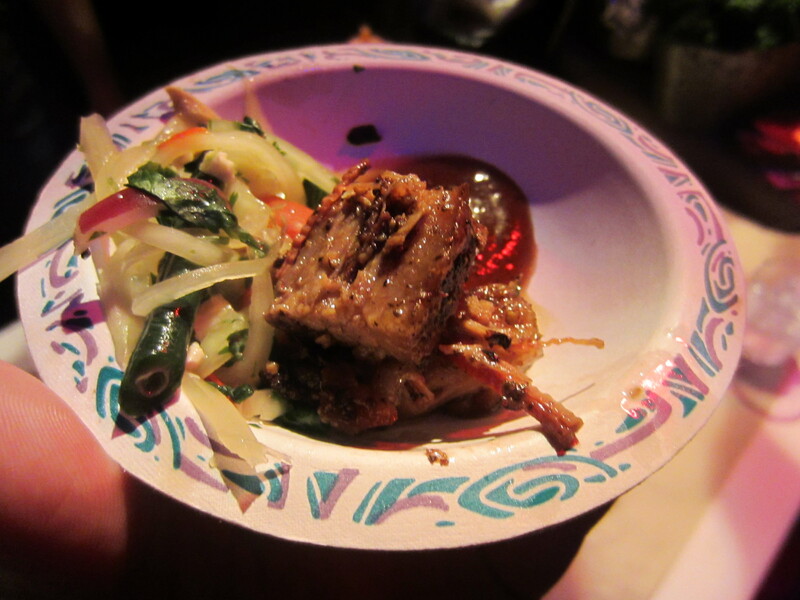 If you love meat and are open to ethnic foods, I’ll take the safe bet that you’ve eaten and love Korean barbecue. Known as “Gogigui” in Korean which translates directly to “meat + roasting”, which is refers to their way of grilling meat. 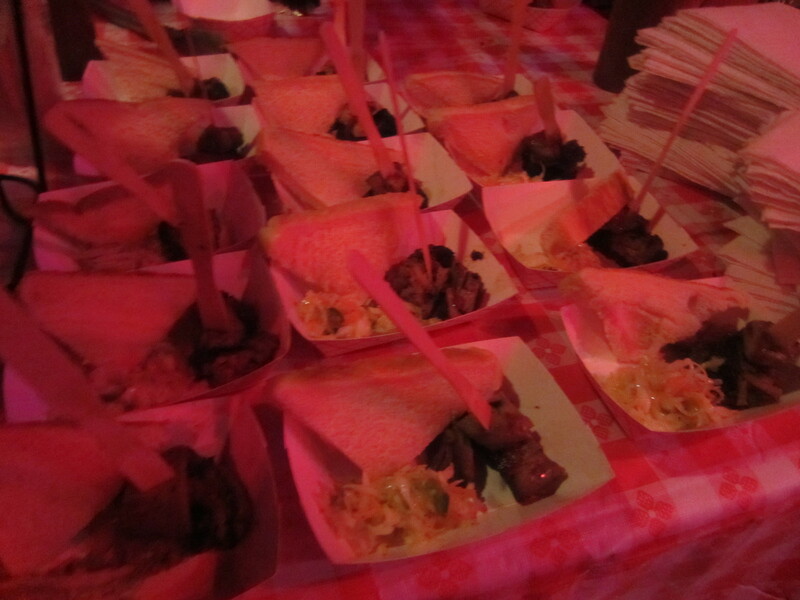 The dishes are prepared right at your table on a table top grill. 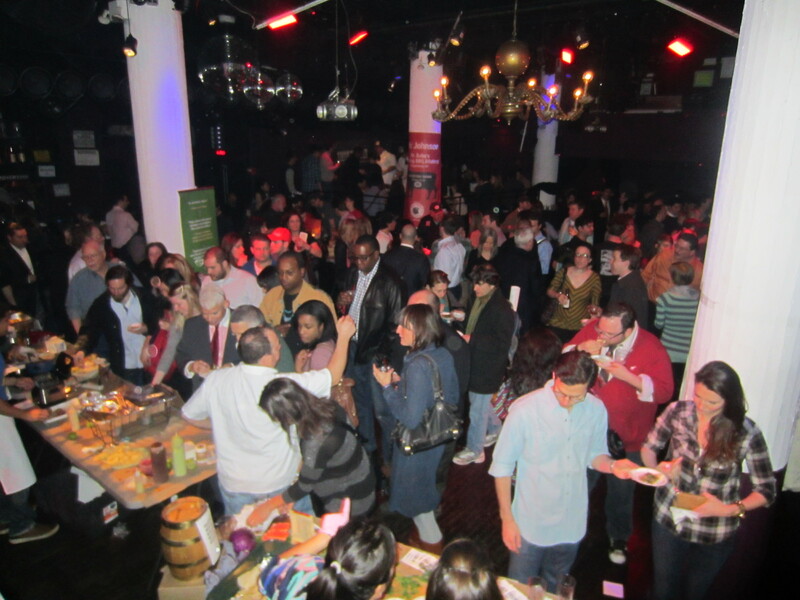 It’s a fantastic way to dine and experience a little food culture. At NYC’s KRISTALBELLI, they take this to a whole new level. 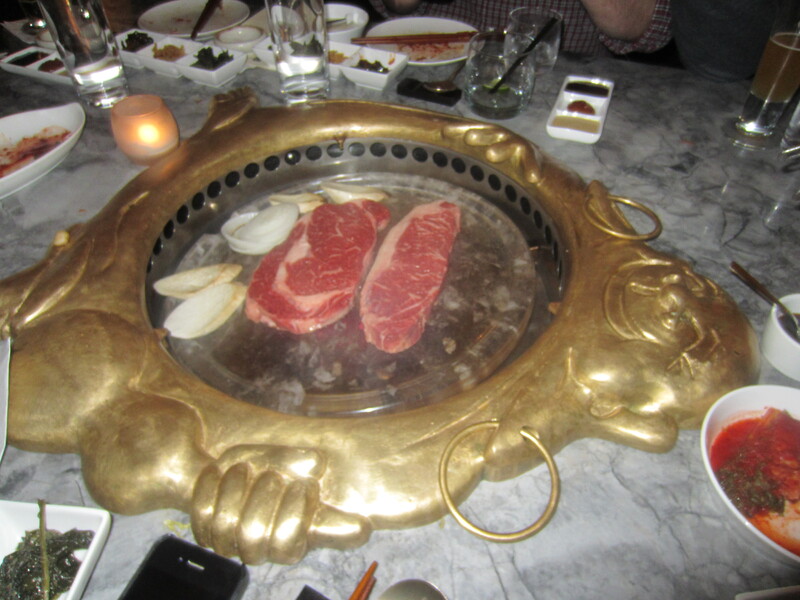 Founded by Korean entertainer, music mogul and business man Park Jin-young (AKA JYP), KRSITALBELLI is a high-end Korean barbecue restaurant located in Midtown Manhattan. 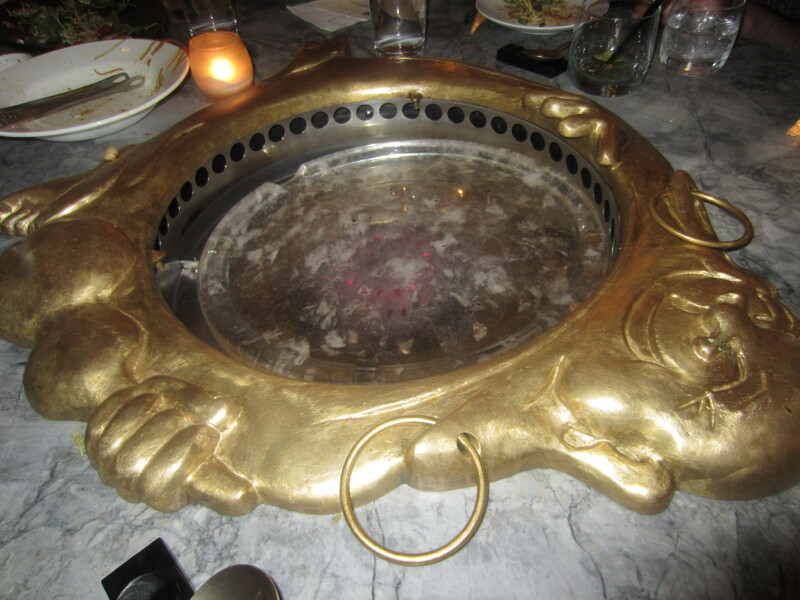 JYP and his restaurant group have worked to create a brand new style of grill fashioned from crystal. The convex surface provides high-heat retention with a perfect distribution and creates a perfect cooking experience. • Cook time – Cooks meat 2~3 times faster compared to traditional stainless or metal grills. • Appearance – Its clear color and shape provides a visual attraction to the grill. • 99.9% natural crystal – The stone does not create any harmful residues. 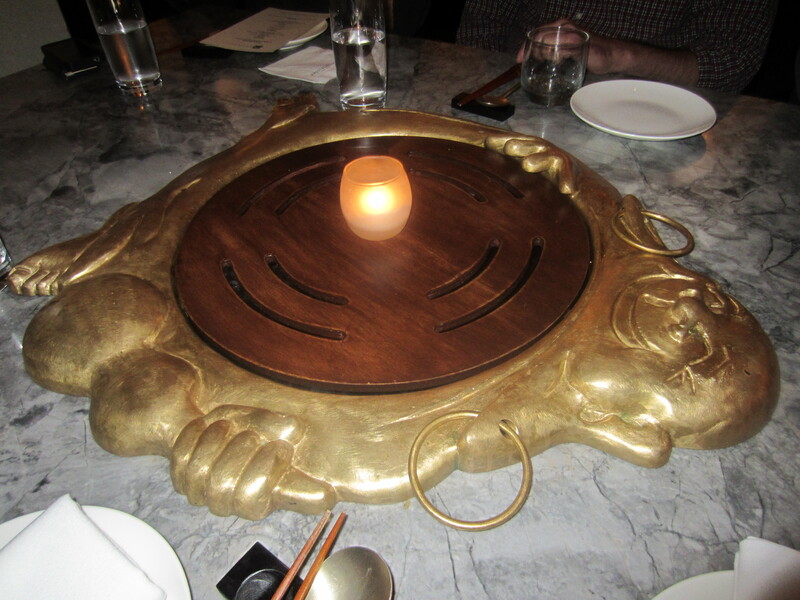 • Artistic grill and table: Kristalbelli’s grill/table is the 1st to be artistically designed when all Korean BBQ grills just focused on its function until now. Our roaster is equipped with the downdraft system, which drags in all the smoke downwards. It’s not only authentic but it’s very stylish and unlike other Korean barbecue restaurants, your server handles all the cooking. 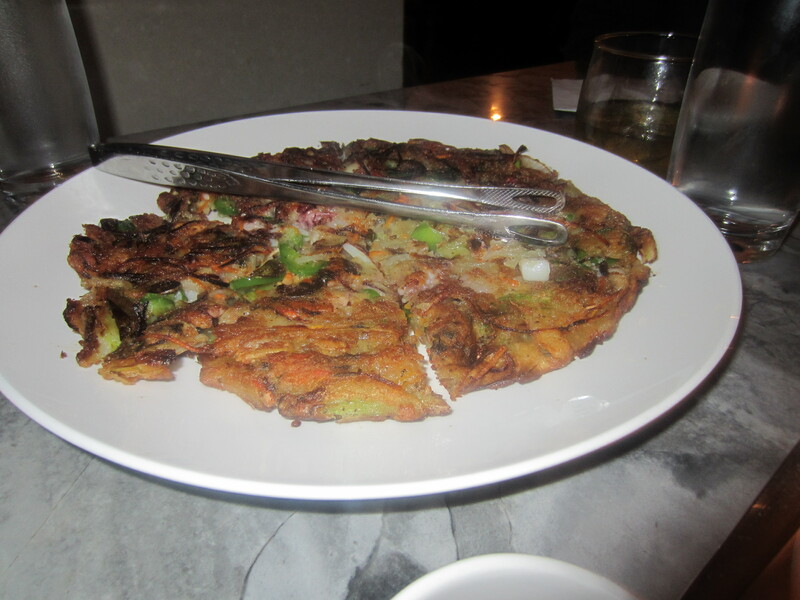 Haemul Pajeon “해물 파전” – Mixed seafood pancake with scallions. I didn’t try this but I really don’t like Seafood. The rest of the guys were into it. 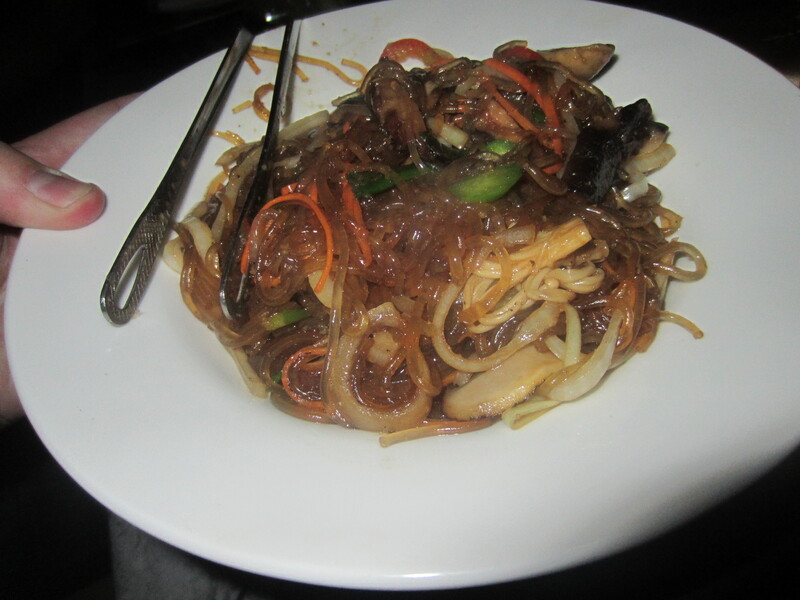 Japchae “잡채” – Stir fried glass noodles with vegetables. 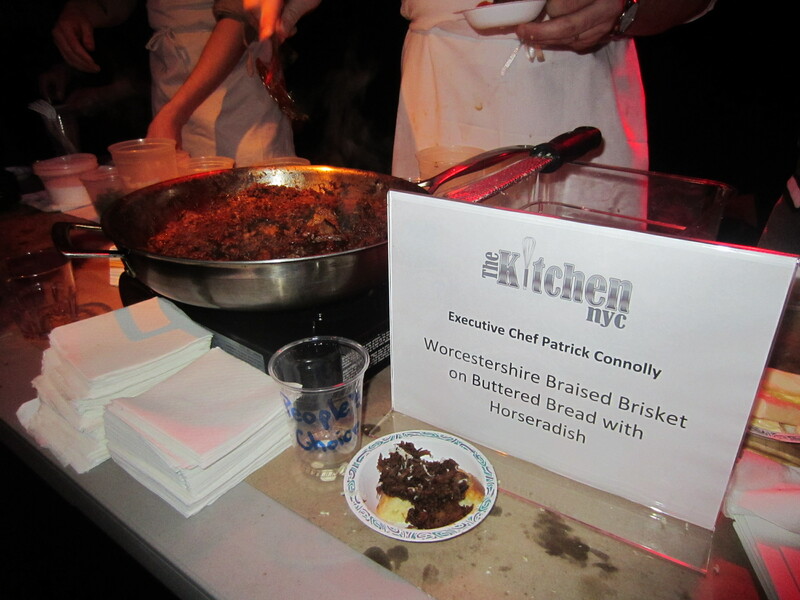 This was delicious and robust with all kinds of great flavors and spices. I could’ve eaten this as an entire meal! 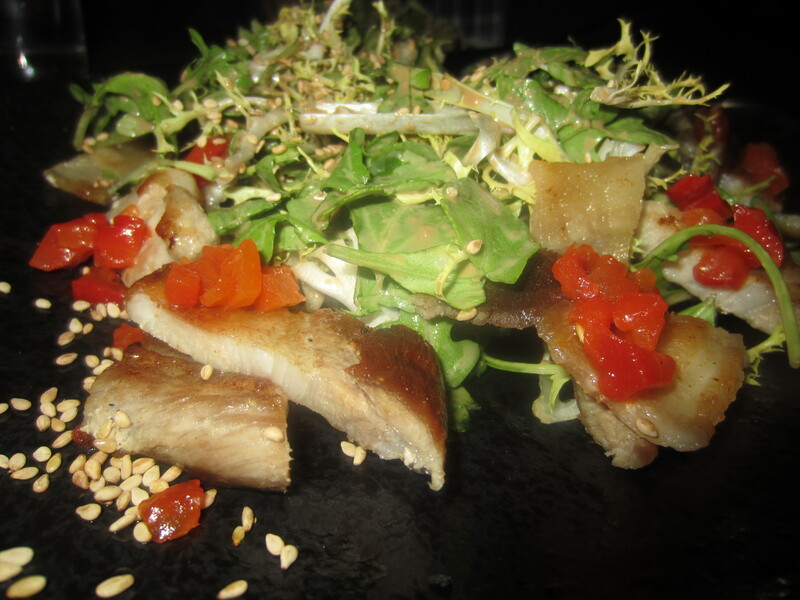 The KB (Kristalbelli) Salad – Sauteed pork belly on top of mixed greens accompanied with soy ginger vinaigrette. Seriously, do not skip on this. It’s simple but incredibly tasty. 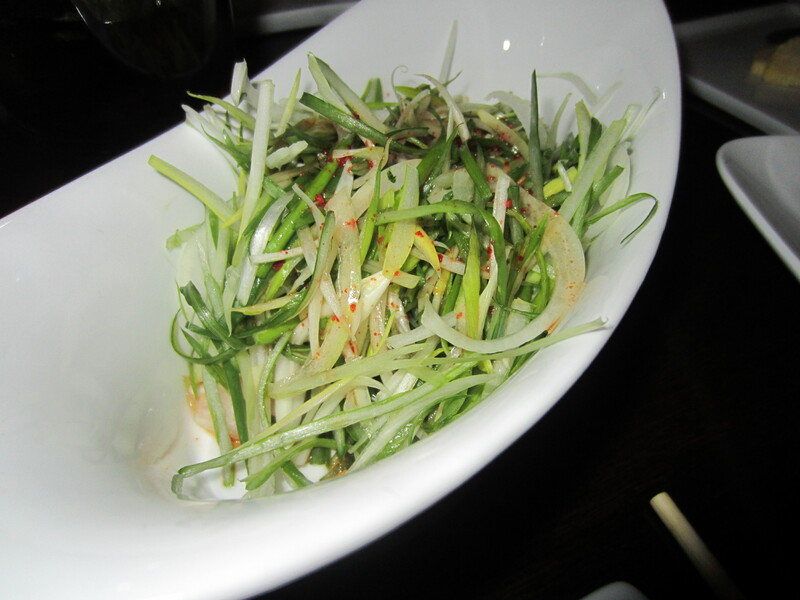 Korean meals often come with lots of sides, dips and prepared vegetables that are meant to be eaten with the main dish so be sure to try everything that comes your way. 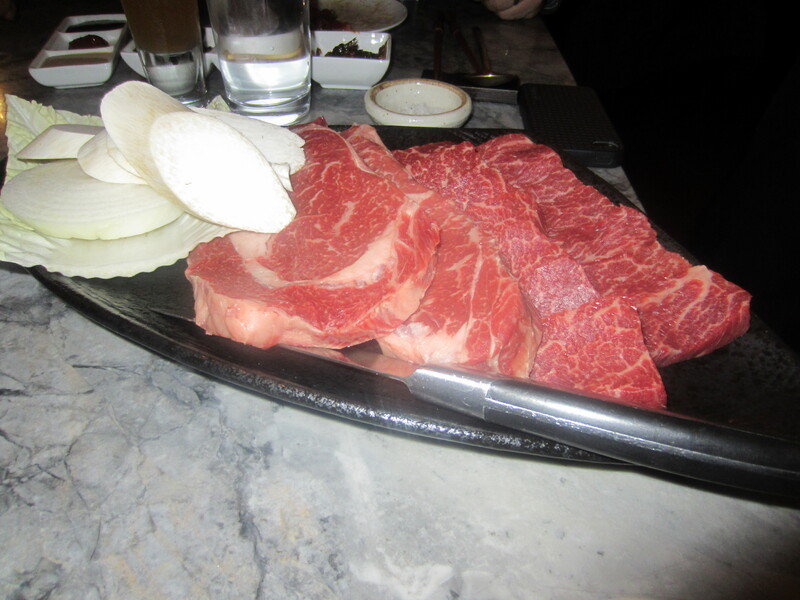 KRISTALBELLI offers four cuts of beef, Filet Mignon, Wagyu Rib Eye, Wagyu NY Strip & Wagyu Galbi . 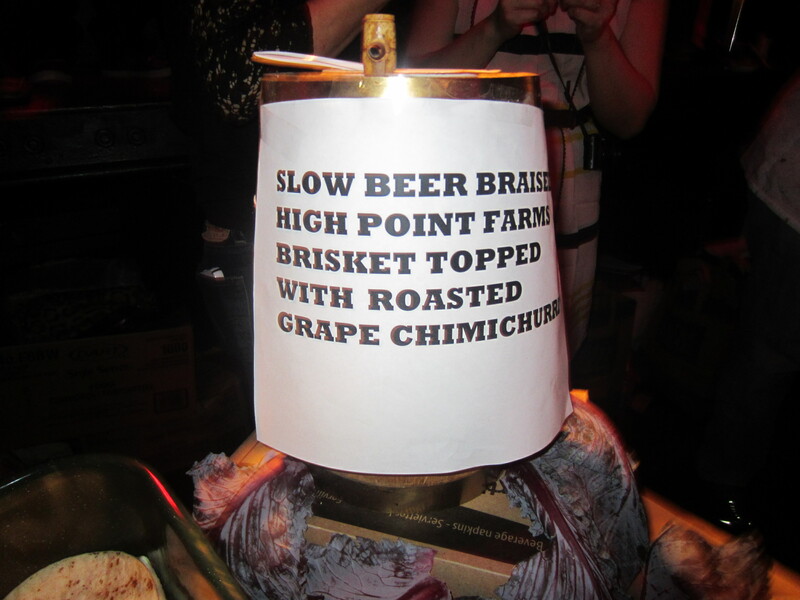 We went with the latter 3 so as to be able to try a bunch of different types. 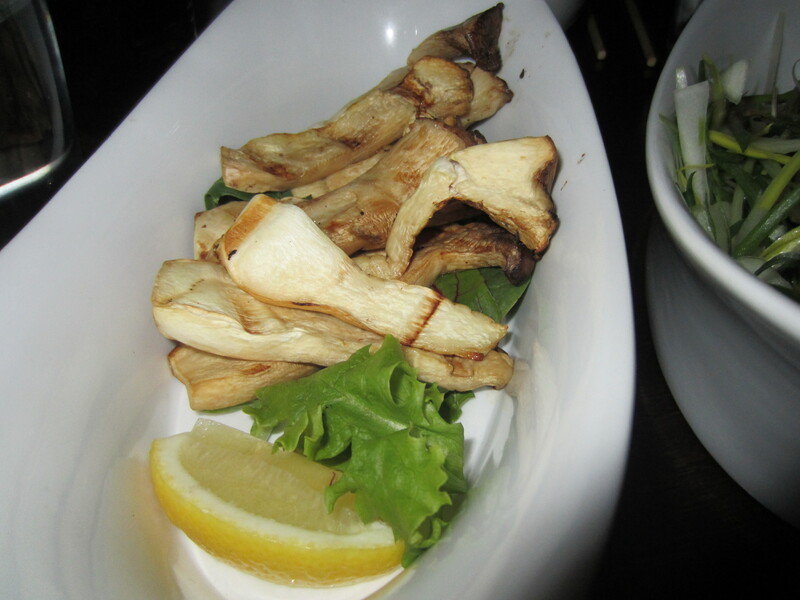 It all comes with onions and mushrooms that your friendly and skilled server will cook for you. Once it was ready, we ate it faster than it took to cook the steaks. Amazing quality, taste, flavor, execution and style. 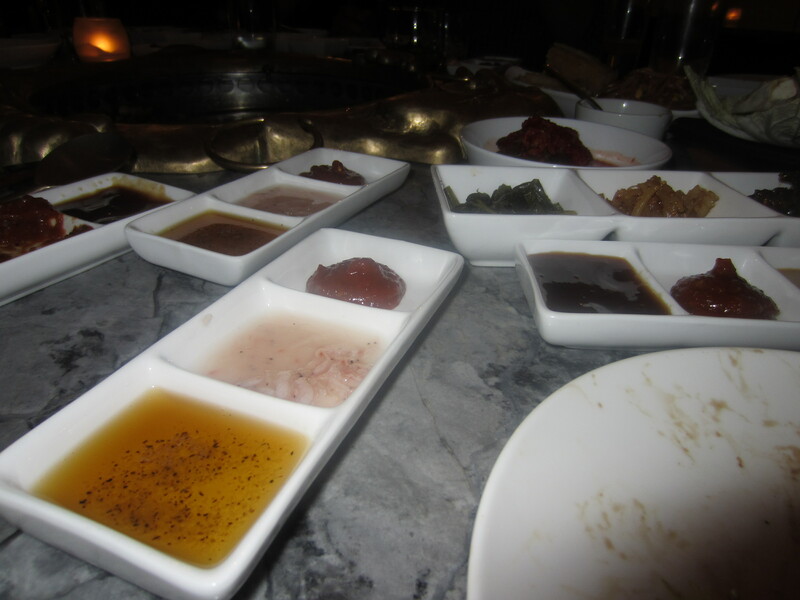 The steaks of course come with more sauces, vegetables and pastes. 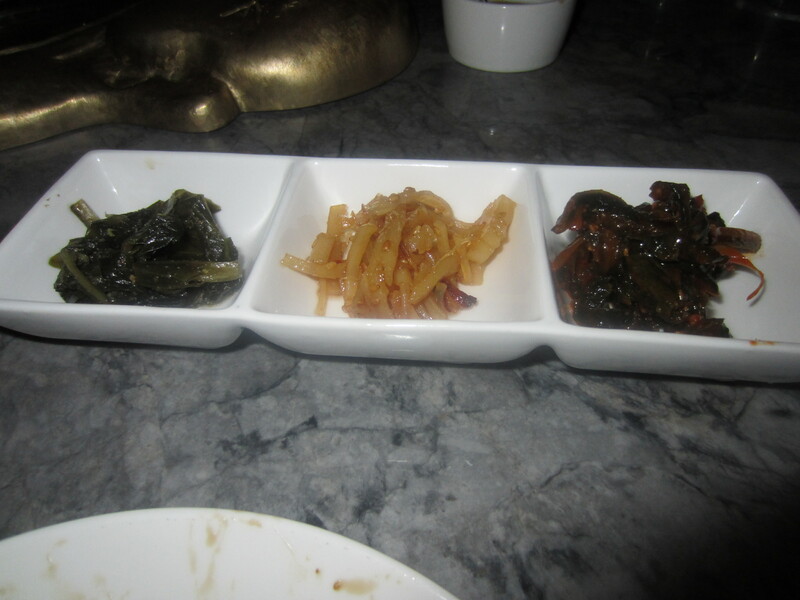 We actually asked for more of the chili paste (bottom, center) because it was so amazing. I want to bottle and sell that. 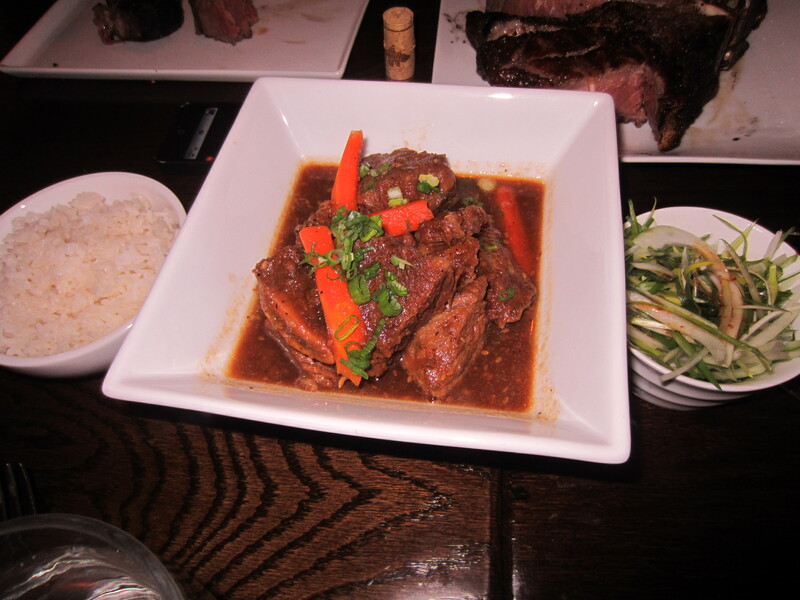 The Wagyu Galbi comes from the Chuck Tail and cut that is not easy to come by. 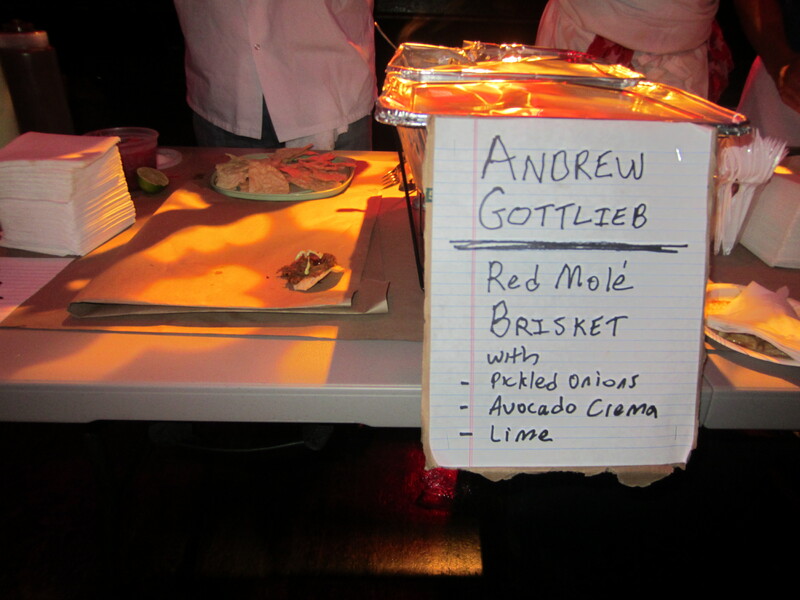 In fact KRISTALBELLI keeps a limited amount on hand so be sure to get there early and order some. 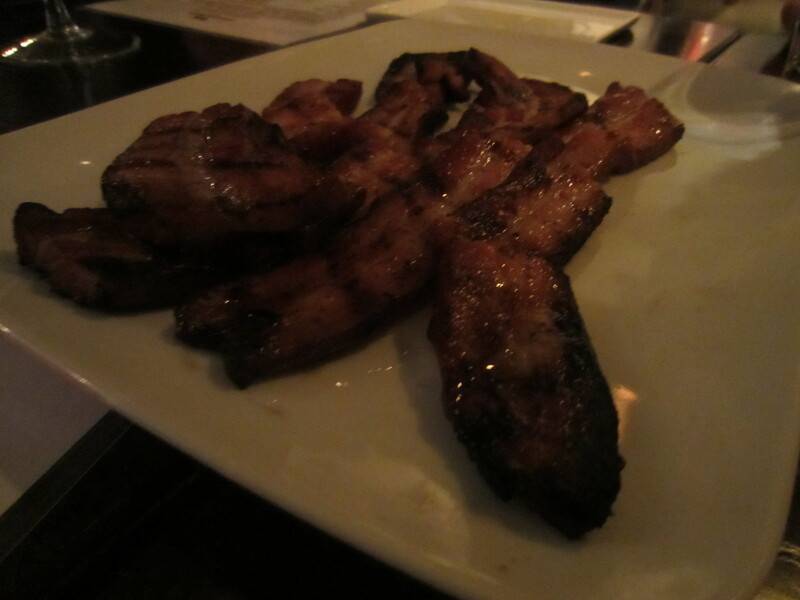 Want to see what $56 worth of bacon looks like? 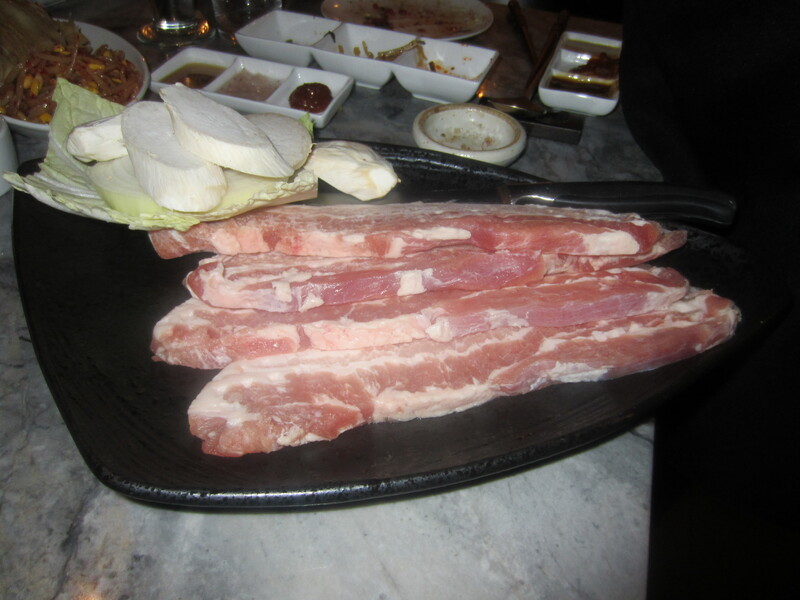 That’s actually 2 full orders of the KRISTALBELLI Samgyeopsal “삼겹살” – Pork belly. 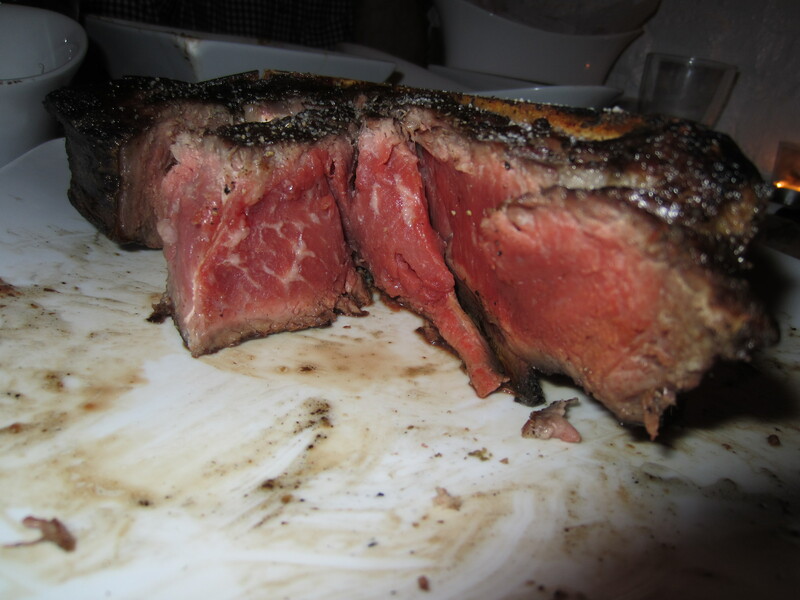 You have never seen a table of men salivate until you’ve witnessed the SteakClub7 watching while their server prepared this on the grill. 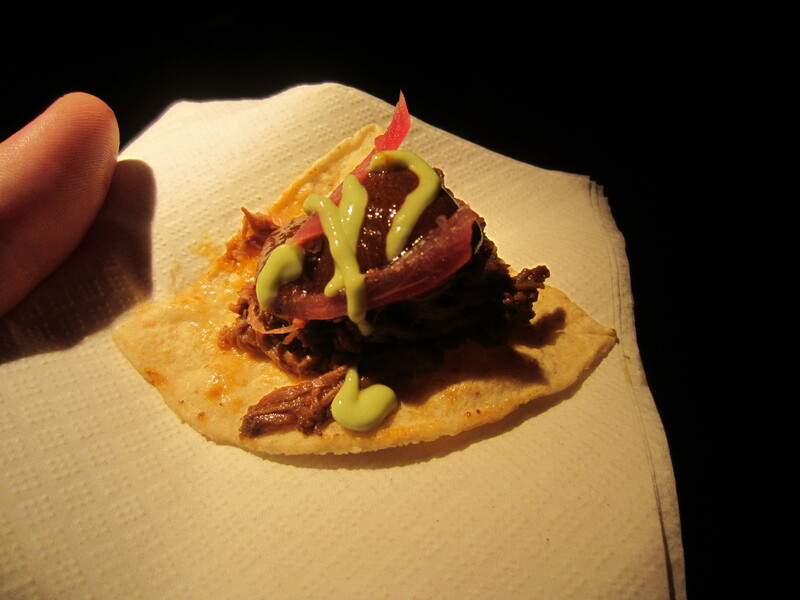 It was incredibly rich, succulent and fresh tasting. Ignore the cost and be sure to order it. 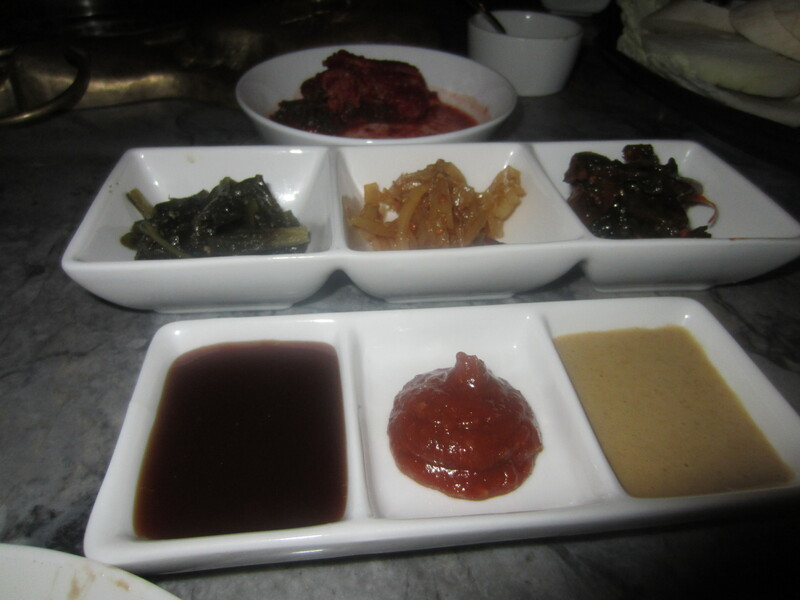 And like all dishes, the Samgyeopsal comes with more delicious sauces to dip in which honestly, it does not need. No matter, you should try them all! 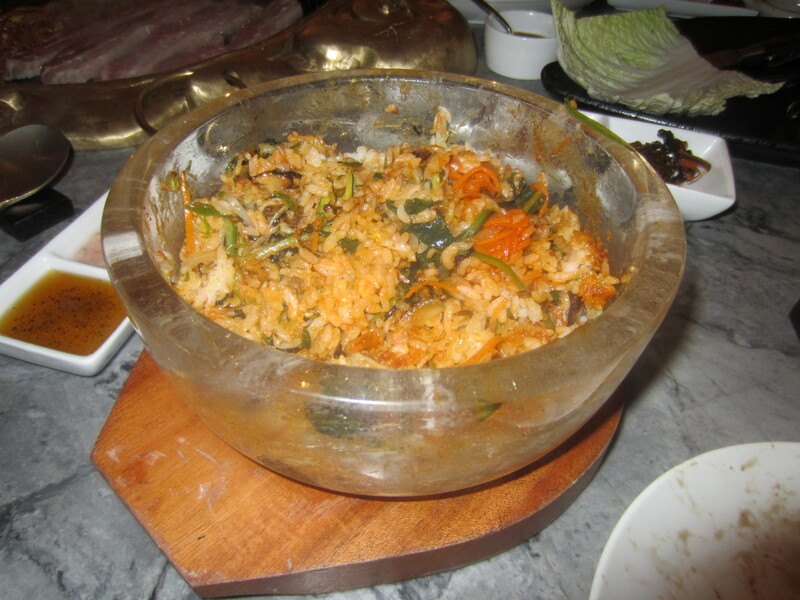 Rounding out the meal we did as you should and ordered Kristal Bibimbap “크리스탈 비빔밥.” Bibimbap is a traditional Korean dish made with rice with seasoned assorted vegetables with chili pepper paste served either cold or hot (choice of beef or tofu) in our signature crystal bowl. As they mix it table side, the rice starts to stick to the bowl and crisps creating something like a moist rice chip. 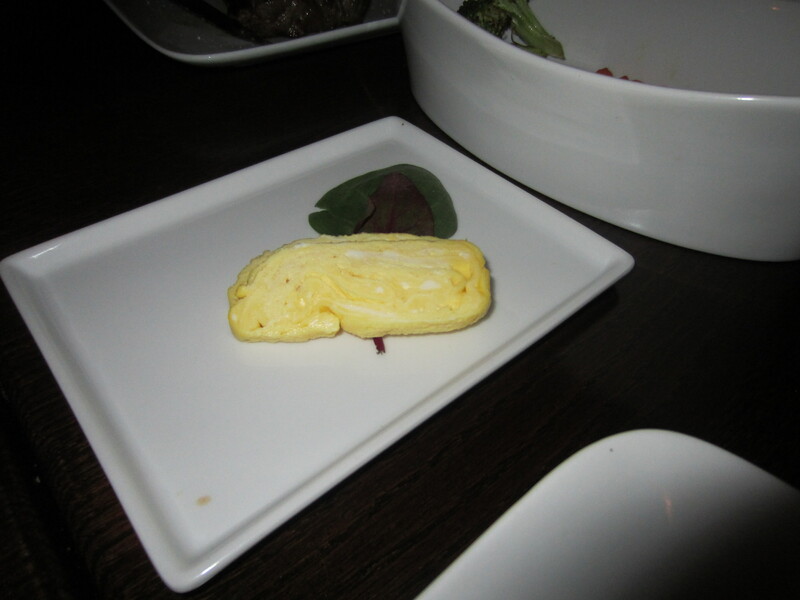 It’s incredible and if do not order this, you did yourself an injustice. We practically fought each other for the last bites. KRISTALBELLI might be a little on the expensive side but you get what you pay for. If you want the best, you have to pay for it. That’s why I suggest going with several people so you can split and try a lot of dishes. KRISTALBELLI is one of the most unique, high quality authentic ethnic dining experiences in NYC and the food, especially the Steak is nothing but delicious. We love Steak. 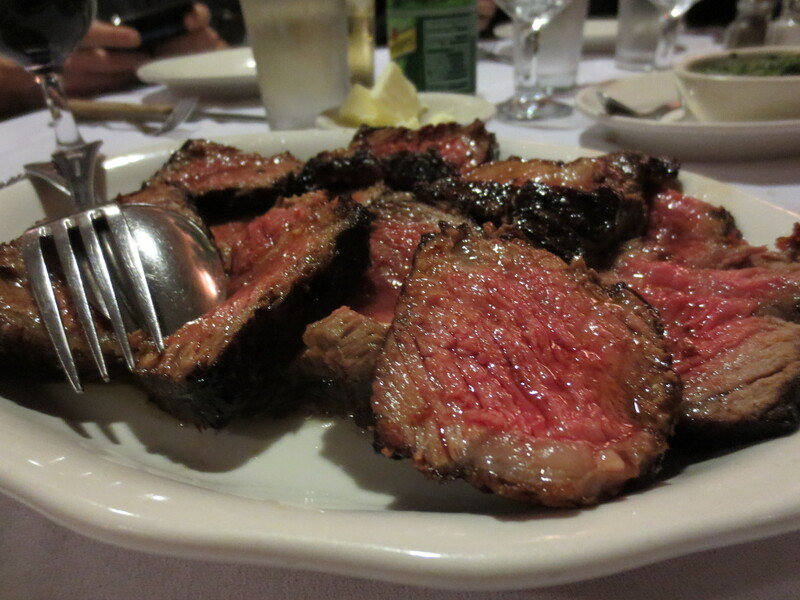 After 7 years of eating it regularly as the world’s #1 steak club, we still yearn for it. Sure, sure, we love the bacon apps, the glasses of scotch, the German potatoes on the side, the creamed spinach, shrimp cocktails, mac n cheese, onion rings, chocolate sundays, after dinner sambuccas and so forth. But what makes it all come together, the reason for the season, the climax of the event…the kairos moment, if you will, is when that tender piece of beef hits the plate, cooked to order, succulent, juicy, bursting with flavor and calling our names. That’s the what where why and who to this club, event and the prior run on sentence. 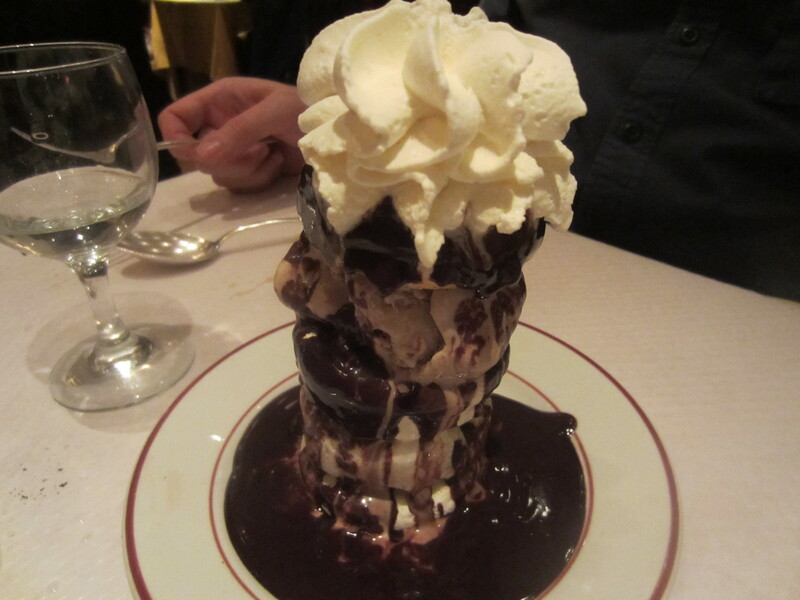 That’s also the reason behind Le Relais de Venise L’Entrecote, the multi city Steak House with a location in NYC. You see, this fine dining and formal eatery has one thing and one thing only on it’s menu: steak. More than 5 decades ago the original location opened in Paris, serving Parisian style Steak Frites. There was no menu then and there is no menu now. Whether you are in Paris, Manchester, one of the locations in London or NYC, the menu, or should I say lack of menu, is the same: Salad, followed by Steak Frites. The waitress, dressed in a French Maid uniform, simply asks how you would like it prepared and then the meal begins. Even though the Big P.A. had been to one of the London locations, the wonderful waitress took the time to explain the process: Salad, Steak Frites, Steak Frites,Pay the Bill, go home. She then politely explained that they only prepare the steak one of 4 ways: 1. Blue, 2. Rare, 3. Medium & 4. Well Done. 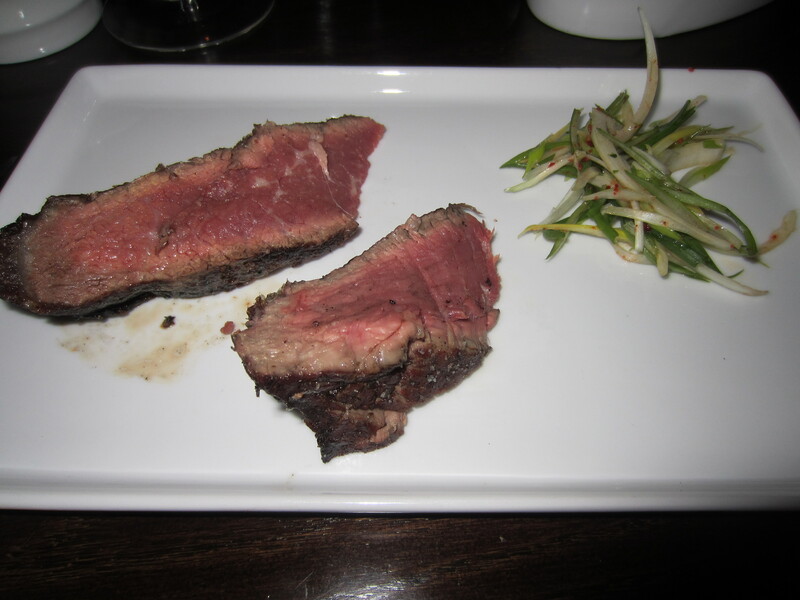 There is no halves, meaning for me, who usually orders medium well, at a Parisian steak house, I go medium. Why? 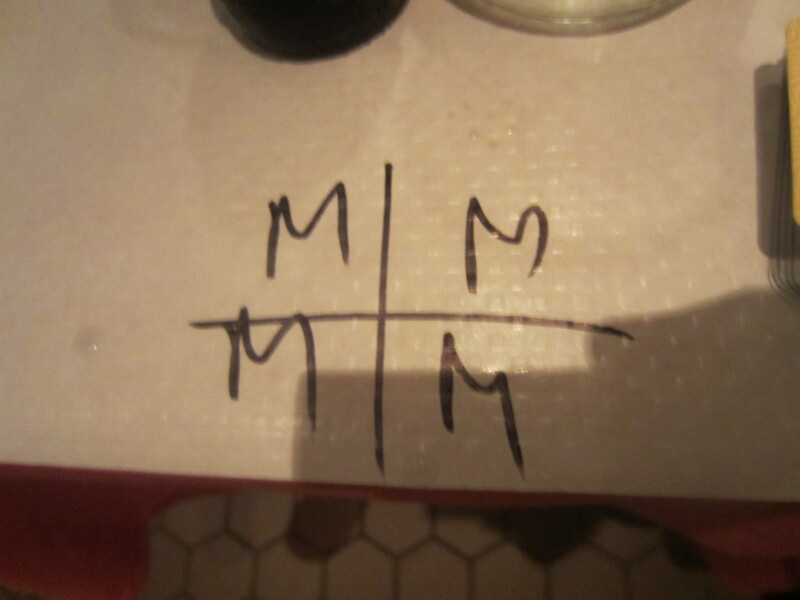 In Parisian steak prep, their M is our MR. Once each of us ordered, the waitress wrote down the selection, on the table cloth and then the meal began. A few moments later, once you’ve tipped into your first beverage, the meal begins. 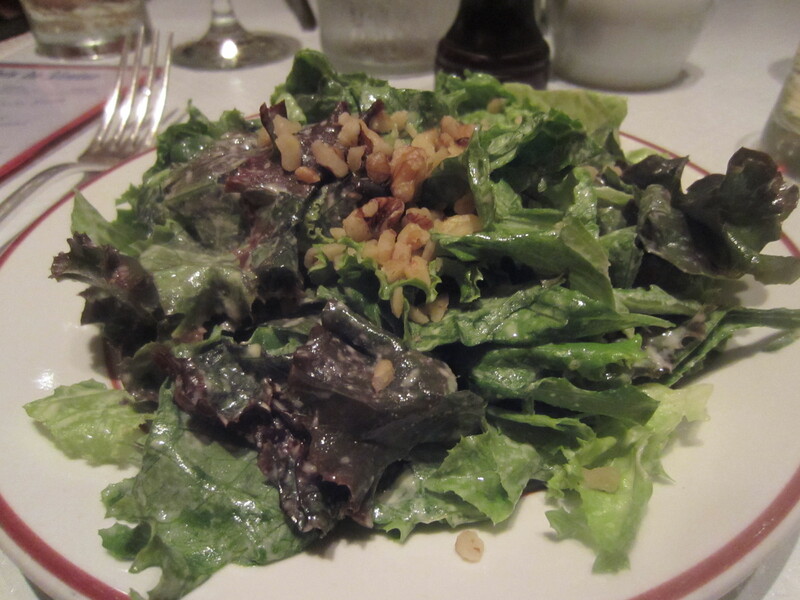 A green salad with walnuts dressed with mustard vinaigrette starts your off right with some green. It’s fresh, clean, easy to eat and preps your stomach for what’s to come. 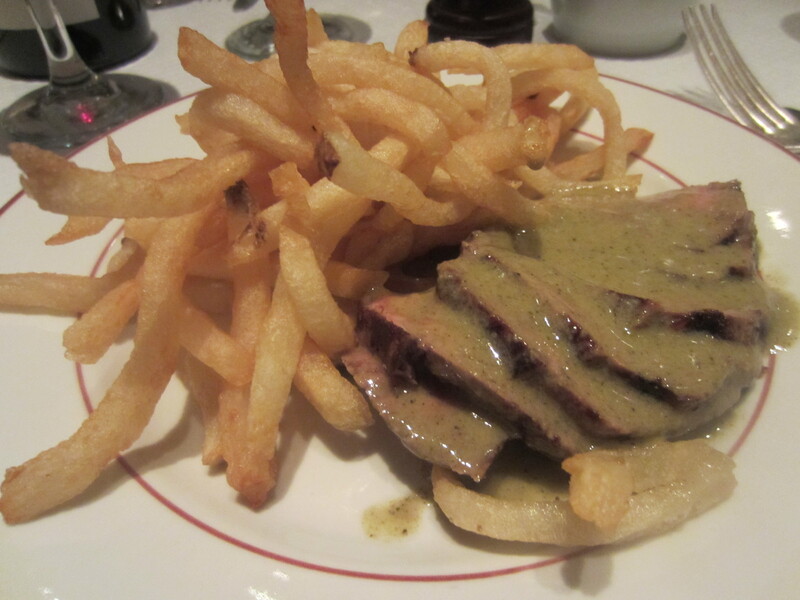 Then, as promised, out comes the sliced Steak & Frites. 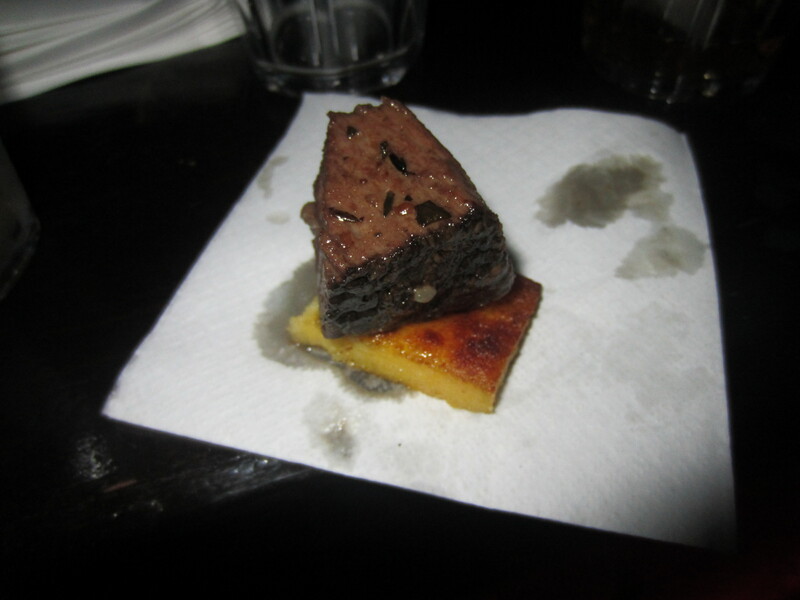 It’s a nice, perfectly cooked piece of sirloin. It’s topped in their secret sauce which tastes like a light peppercorn gravy. It’s freakin delicious. No joke, the steak is spot on. 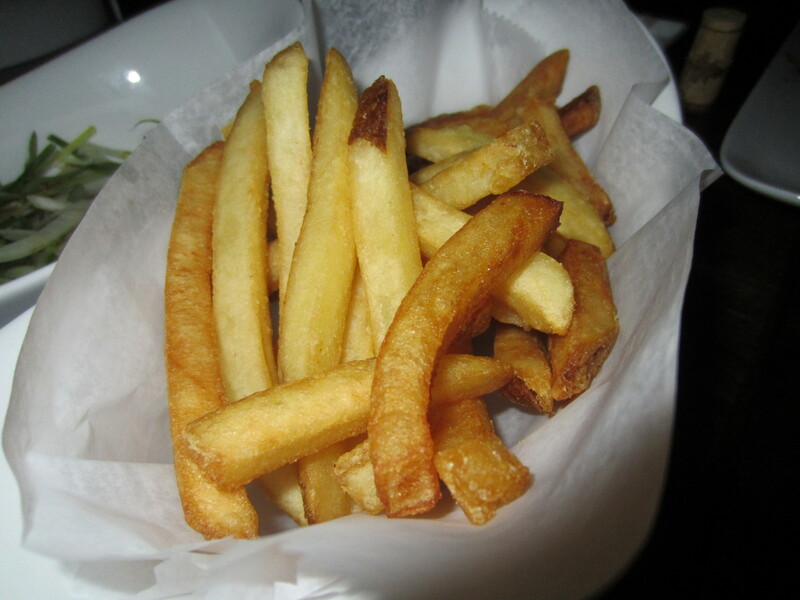 The frites, just the right amount of crisp. The sauce, doesn’t over power the meat but adds to the already succulent flavor. As your rounding out the last couple of bites of your steak and frites, you’ll probably think: “this isn’t going to be enough. 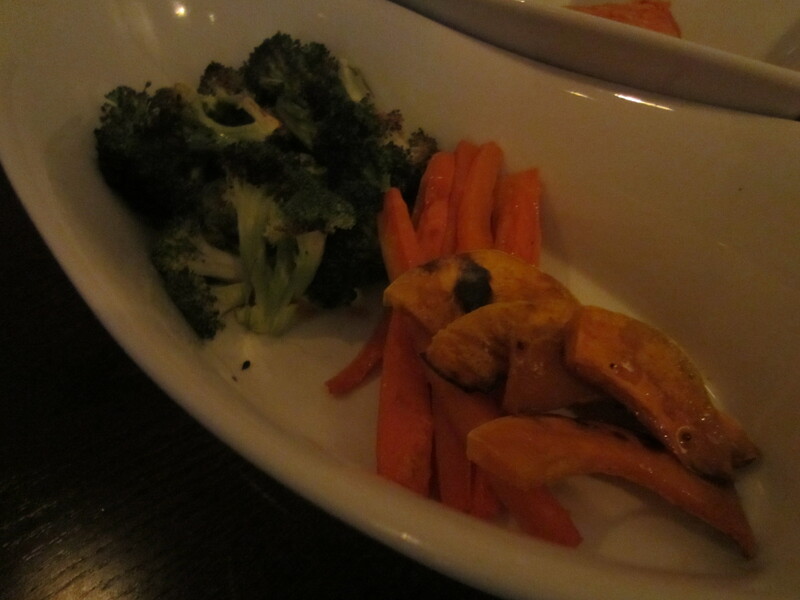 I am going to want more.” We most certainly did and Joe C even jokingly asked if we could see the “other” menu with the appetizers and sides. Our waitress was a good sport about it and giggled. She then asked if we were ready for our 2nd helping of steak frites. 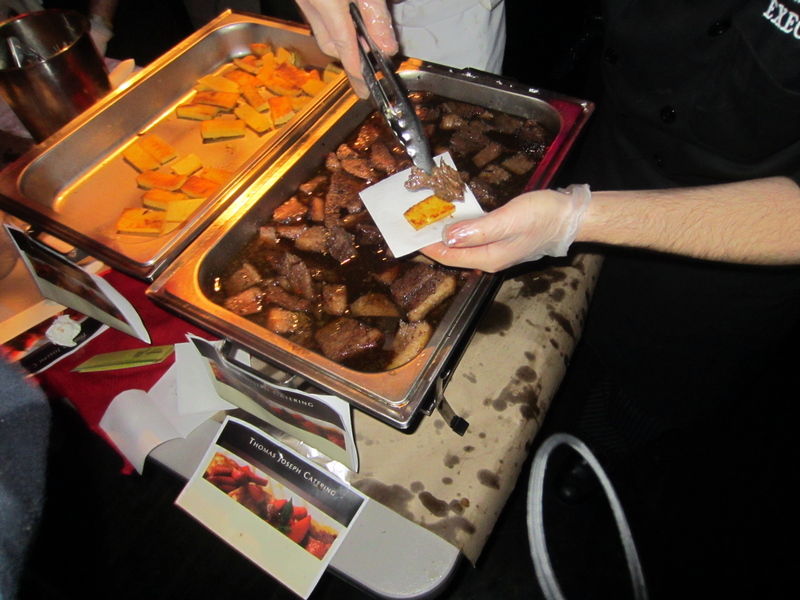 So yeah, that’s it: Salad, Steak Frites & more Steak Frites. By the time you rock through the 2nd helping, you’re going to be about full. The timing at which it’s served along with the place will more than surely fill you up. That is, unless you are the the Big P.A. He demanded we split a chocolate sunday. Now here is the funny thing about the dessert menu at Le Relais de Venise, it’s rather extensive. Where and how that decision came from, I have no idea but I guess if you get that far into the meal, you are welcomed with a delectable menu of choices. I couldn’t imagine another bite but that my friends, is just how the Big P.A. roles. 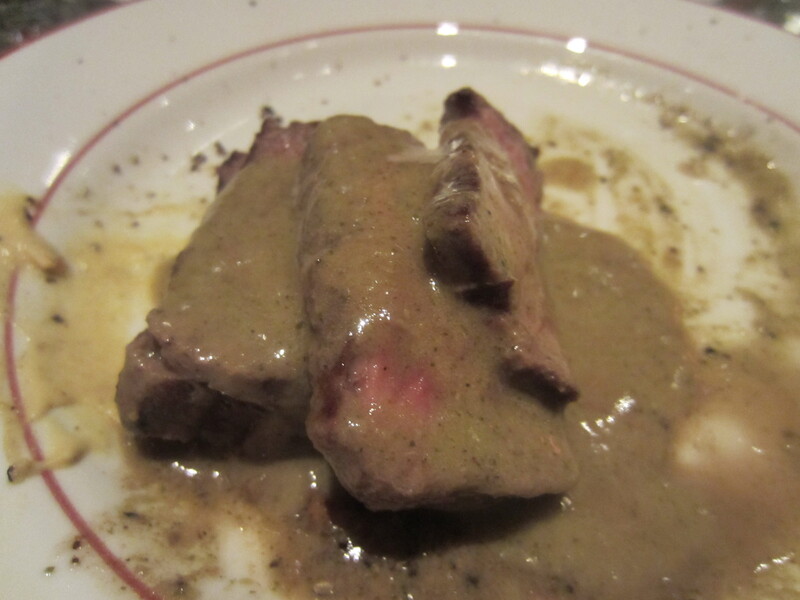 If you love steak, you will love Le Relais de Venise. That’s all they serve and after you taste one bite, you’ll understand why they don’t need to serve anything else. If you can do it right and do it better than anyone else, you win.